For previous offensives in Deir ez-Zor, see Deir ez-Zor clashes. For the offensive by the Syrian Army in Deir ez-Zor, see Battle of Deir ez-Zor (September–November 2017). The Deir ez-Zor campaign, codenamed the al-Jazeera Storm campaign, was a military operation launched by the Kurdish-led Syrian Democratic Forces (SDF) against the Islamic State of Iraq and the Levant (ISIL) in Syria's Deir ez-Zor Governorate in 2017 during the Syrian Civil War with the goal of capturing territory in eastern Syria, particularly east and north of the Euphrates river. The U.S.-led Combined Joint Task Force – Operation Inherent Resolve (CJTF–OIR) anti-ISIL coalition provided extensive air support while SDF personnel composed the majority of the ground forces; CJTF-OIR special forces and artillery units were also involved in the campaign. The ground campaign stalled and was paused in early 2018 due to the Turkish-led invasion of Afrin, but resumed on 1 May 2018 with the new phase named by the anti-ISIL Coalition as Operation Roundup. The third phase started on 10 September 2018 but was once again halted due to Turkish artillery attacks on SDF positions near the Syria-Turkey border on 31 October. The SDF and the Coalition announced the resumption of the offensive on 11 November. After a string of steady success following the capturing of ISIL's Hajin stronghold and a ten-day pause for civilian evacuations, the SDF launched its final assault on the remainder of the Middle Euphrates River Valley (MERV) pocket on 9 February 2019. The first phase of the campaign was concurrent with another SDF operation, the Raqqa campaign conducted against Raqqa, ISIL's then-capital city and stronghold in Syria, as well as with the Central Syria campaign, the Eastern Syria campaign, and the Battle of Deir ez-Zor in which the Syrian Army (SAA) was also capturing territory from the Islamic State; the Iraqi Army's Western Iraq campaign against ISIL was also underway. The entirety of the SDF's campaign was also concurrent with the Syrian Army's Syrian Desert campaign. On 25 August 2017, around 800 fighters from the Syrian Elite Forces defected to the SDF's Deir ez-Zor Military Council. On the same day, Ahmad Abu Khawla, commander of the Deir ez-Zor Military Council, announced that it would launch an offensive north of Deir ez-Zor within several weeks. Just before the start of the offensive, the SDF received a large amount of new weaponry and ammunition from the U.S.-led CJTF–OIR Coalition. The SDF launched their ground operation on 8 September 2017 by attacking ISIL-held villages in the northern Deir ez-Zor countryside; on the next day, the campaign was officially announced in the al-Shaddadah Subdistrict, with the stated aim of expelling ISIL from all areas north and east of the Euphrates river. During the course of the next two days, the SDF rapidly advanced and captured numerous villages. According to pro-Syrian opposition media, this quick initial progress was due to ISIL forces retreating from areas that were difficult to defend in the face of heavy CJTF–OIR airstrikes. 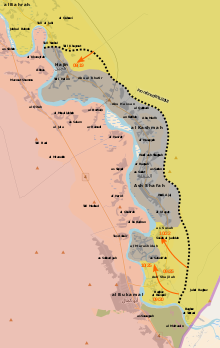 On 10 September 2017, the SDF fought its way into the fortified 'Industrial City', directly north of Deir ez-Zor city, while capturing more nearby villages. On 12 and 13 September, the SDF captured several locations at Deir ez-Zor's northern entrance (including the former Brigade 113 and al-Niran Battalion bases, the Sadkob station and part of the sheep market) as well as the silos and cotton storages in the Industrial City. Anti-ISIL forces also made further progress in the desert north of Deir ez-Zor, where it advanced 60 km. Despite these successes for the SDF, ISIL began offering stiffer resistance and began launching repeated counterattacks supported by VBIEDs in an attempt to stall the offensive and/or recapture territory. Meanwhile, the SDF leadership stated that their forces would not attack Syrian government troops, which were simultaneously battling ISIL on the west side of the Euphrates. On 15 September, Ahmad Abu Khawla, commander of the SDF's Deir ez-Zor Military Council, however, stated that it will not allow Syrian government forces to cross the Euphrates. The next day, alleged Syrian or Russian aircraft bombed SDF positions on the eastern bank of the Euphrates, injuring six SDF fighters. In response, CJTF–OIR stated that while they were putting their "full efforts into preventing unnecessary escalation among forces that share ISIS as our common enemy", "Coalition forces and partners always retain the right of self-defense". In this context, Institute for the Study of War expert Chris Kozak said that neither Russia nor the United States had an interest in escalating a conflict between themselves. "The real threat [is instead] that the partner forces on the ground—the SAA and the SDF—come close [to confrontation] before the US and Russia can slow them down." The Syrian government and the SDF are rivals in the Deir ez-Zor Governorate, as both sides want to capture the region's natural resources (most importantly its oil fields). On 17 September, the SDF captured a textile factory and a roundabout 7 km from Deir ez-Zor city. On 20 September, the SDF opened a second front against ISIL east of Deir ez-Zor, near the border with Iraq, and seized six villages alongside the M7 highway in quick order, advancing towards the oil-rich eastern countryside of Deir ez-Zor. On 21 September, Russia warned it would attack SDF fighters if provoked. As a response to the SDF advances, ISIL began to launch raids into SDF-held areas in southern al-Hasakah Governorate, reportedly ambushing and killing several SDF fighters on 21 and 24 September. ISIL counterattacks did little to impede the SDF offensive, however, with the SDF proceeding to capture the Al-Izba and Conoco gas fields, the Derro oil fields, and the Al-Bazikh mountain chain. On 25 September, Russian aircraft, as well as Syrian and Russian artillery, bombarded SDF troops at the Conoco gas field, causing several casualties. The SDF responded by stating that "Russian and regime forces have mounted a treacherous attack against our forces," and that they would "use [our] legitimate right to self-defense". Further Russian bombing was reported on 27 September, with the SOHR claiming 6 civilian casualties in Marat, to the east of the Euphrates River, opposite the Deir ez-Zor Military Airbase. Iranian missile strikes on ISIL in the southern and eastern parts of the province were also reported on 24 September. Despite the Russo-Syrian airstrike incidents, the SDF continued the offensive and pushed ISIL out of numerous villages over the following days. At al-Suwar, however, the SDF troops met fierce resistance on 24 September, and a heavy battle ensued; after six days of fighting the town finally fell. The SDF then attempted to further advance in al-Suwar's surroundings, while ISIL launched counterattacks to retake it. Meanwhile, on 28 September, Yasser al-Dahla of The Gathering of al-Baggara Youth group was arrested by SDF military police on accusations of not effectively participating in the offensive and a "lack of military discipline". The Gathering of al-Baggara Youth denied these charges, and accused the Deir ez-Zor Military Council of denying Euphrates Shield fighters who defected to the SDF to join the Gathering. Dahla reportedly threatened to cease his group's participation in the Deir ez-Zor offensive. On 30 September, the SDF took control of the Jafra oil fields, which was one of the "most important sources of income for IS". Between 1 and 9 October, the SDF captured several more villages and repelled further ISIL counterattacks, with ISIL resistance in these areas being mostly light. This was due to ISIL relocating many of its troops from its frontlines with the SDF in order to face the encroaching Syrian Army. ISIL prisoners of war in the custody of the SDF after surrendering during the campaign in October 2017. Between 9 and 10 October, the SDF captured four villages while advancing on the eastern bank of Euphrates river. Around a dozen SDF fighters were executed after ISIL recaptured al-Jazrah oilfield on 12 October. Many SDF fighters were killed and executed on 15 October after ISIL attacked their positions on the provincial border between al-Hasakah and Deir ez-Zor, infiltrating several checkpoints and outposts along the main road between Al-Salhiyah and Sor. Syrian military reports claimed on 19 October that the SDF had allowed Russian troops to enter and take control of Conoco gas field, despite both the SDF and the SAA trying to take control of al-Omar gas field from ISIL. Laila al-Abdullah, the spokesperson of the SDF, announced that they had captured the al-Omar oil field after a military operation in early hours of 22 October, and were clashing with ISIL fighters in an adjacent housing complex. SOHR stated that it had entered the oilfield after pro-Syrian government forces withdrew following an ISIL attack on them. The SDF, later in the month, started advancing towards Abu Kamal and reportedly captured sites south of the oilfields. ISIL counterattacked on 29 October in an attempt to recapture the oilfield and was able to capture large territory along its perimeter while killing 6 SDF fighters. By November 2017, the SDF had reached the western outskirts of Markadah. On 3 November, the SDF captured six villages while advancing on three different fronts. One village on the eastern bank of the Euphrates was captured near the Al-Busayrah axis, about 30 kilometres (19 mi) southeast of Deir ez-Zor city. Two villages around 70 kilometres (43 mi) northeast from the city and located near the border with Iraq were also captured. In addition, three villages 50 kilometres (31 mi) east of Deir ez-Zor city and located on the bank of the Khabur river were captured by the SDF. On 6 November, the SDF cleared an ISIL pocket at Khabur after two SDF pincers met on both sides of the river and captured six villages, about 35 kilometres (22 mi) east of Deir ez-Zor city. An ISIL POW with a self-inflicted wound. As the organization's military continued to retreat in eastern Syria, an increasing number of its fighters shot themselves in order to lag behind and be captured by the SDF. On 7 November, the SDF captured a village while advancing on the southwest along Khabur. The SDF captured the key town of Markadah on 8 November. On 12 November, the SDF captured Al-Busayrah and all neighboring villages, thereby completely eliminating an ISIL pocket to east of Euphrates. The SDF captured the Tanak oil fields on the next day. On 14 November, the SDF pushed southwards along the river, capturing a village and killing 11 ISIL militants. By the next day, they had advanced within 15 kilometres (9.3 mi) to the border with Iraq, according to the Syrian Observatory for Human Rights (SOHR). After ISIL lost Al-Qa'im and Abu Kamal, to the Iraqi and Syrian Army, respectively, ISIL moved its de facto capital to the Syrian city of Hajin, in the Middle Euphrates Valley. The SDF's Deir Ezzor Military Council reached the Iraqi border on 25 November, through the northern countryside of Albu Kamal, effectively cutting off the Syrian Arab Army from the border crossings to the north of the town. The United States Department of Defense (U.S. DoD) announced in February 2018 that Shaykh Abu Anas al-Furati, a senior ISIL commander, was killed in an airstrike on Hajin on 27 November. The YPG declared on 3 December that it had completely captured the eastern countryside of Deir Ezzor. SDF captured three villages 70 kilometres (43 mi) south of Deir Ezzor city on 9 December. During the clashes, it was struck by a car bomb in a village, with Amaq News Agency claiming deaths of 15 SDF fighters. The alliance was meanwhile aided by Russian airstrikes. The SDF's Deir Ezzor Military Council reported on 12 December that their forces had captured several towns along the eastern bank of the Epuhrates, including Hasiyat, Jayshiyah, Jadleh, Al-Bahrah, and Gharanij after a brief battle. Taking advantage of ISIL's concentration on attacking the Syrian Army on the western bank, during the week, the SDF took over several towns controlled by the group. SDF's official media wing reported capture of Jurdi Al-Sharqi on 13 December after a brief battle. SOHR meanwhile stated that 23 civilians had been killed by airstrikes carried out by the US-led Coalition in an ISIL-controlled village on the eastern banks. The U.S. DoD announced in February that ISIL military commander Abd al Rahman Filipini, was killed near Hajin due to airstrikes on the same day. On 16 December, the SDF, led by the Deir Ezzor Military Council, captured several sites, including towns of Abu Hardub and Hasiyat. This allowed them to secure complete control over the Murad Oil Field, located northeast of Abu Hardub, thus leaving the remaining populated areas to secure from ISIS east of the Euphrates, stretching from the town of Hajin, down towards the border with Iraq, within the administrative district of Abu Kamal. ISIL counterattacked SDF positions along Euphrates on 22 December, attempting to push back towards Al-'Umar oil fields. Pro-SDF media claimed to having foiled the attack and having killed 21 ISIL fighters. ISIL-affiliated media claimed on 29 December that they had struck SDF in a car-bomb attack amidst a counterattack near Al-Bahrah village. It claimed to have so far killed 3 SDF fighters and wounded 7 in the battle. Later on 29 December, according to both pro-Syrian opposition and pro-Kurdish sources, on 29 December, the SDF captured four towns and villages to the north of ISIL stronghold of Haijan. The advance bypassed the Shaitat tribal region, encircling ISIL in the area. SDF claimed it had killed 67 ISIL fighters while capturing the villages. The four settlements reported captured were Al-Bahrah, Al-Kahawi, Al-Jabal and Kushkiyah. SOHR on the next day reported heavy fighting between both groups on the eastern banks with ISIL managing to capturing Abu Hamam. Later on the same day, SDF captured the town of Khara’ij and the village of Al-Marsama Gharbi. It also entered Abu Hamam. ISIL claimed on 31 December that 20 SDF fighters and 50 others had been wounded in a car bombing carried out by a German jihadist on them, at al-Bahra. On 1 January 2018, it was announced that the YPG/YPJ's Anti-Terror Units had killed ISIL commander Hisen Ayid el-Bilebil Ebu el-Walid, the mastermind of July 2016 Qamishli bombings, in al-Busayrah. SOHR stated on the same day that 12 civilians were killed in air strikes on ISIL-held Susa village. Meanwhile, Kurdish sources claimed that the SDF had captured the town of al-Sabha. Pro-Kurdish and pro-Coalition sources reported on 2 January that the SDF had captured towns of Abu Hardub and Al-Nabayi, killing at least 17 ISIL fighters. The U.S. DoD announced in February that ISIL military commander Abd al Rahman al Tamimi was killed in airstrikes near Hajin on the same day. On the next day, the SDF announced capture of towns of Muhamidah, ‘Ard Al-Zir and Al-Majeed. They were also engaged in heavy clashes for control of Abu Hamam and Hajin. On 4 January, it was reported that they had captured the ISIL stronghold of Gharanij. Meanwhile, SDF announced capture of villages of Elias and Jadlah to north of Hajin, killing 11 ISIL members while Amaq claimed killing of two SDF fighters in al-Kishkiyah village of Jadlah. ISIL also shelled SDF in al-Kishkiyah and al-Bahrah. U.S. DoD announced in February that Haytham al Jazairi and Hassan al Jazzari, part of ISIL's immigration logistics group, were killed in airstrikes on 6 January near Khara’ij and Abu Hammam respectively. An ISIL counterattack on 7 January on Al-Bahra failed. SDF media center claimed 27 ISIL fighters were killed while Amaq claiming 4 SDF fighters were killed. An Arab SDF unit meanwhile stated that SDF had launched an attack on Gharanij while opening a corridor to allow ISIL fighters to withdraw to Hajin. ISIL official media stated it had recaptured Gharanij on 9 January in addition to killing 20 SDF fighters. SOHR reported on 10 January that SDF had released more than 400 Syrian ISIL members in Deir Ezzor. It added that out of the 400, 120 former ISIL fighters had joined the SDF. The US-led anti-ISIL Coalition however later on 15 January denied the allegations that SDF had recruited former ISIL fighters. ISIL-affiliated media claimed that an Uzbek suicide bomber killed or injured 20 SDF fighters during the night on 10 January. ISIL attacked a village south of al-Shaddadi city on the next day, with Amaq claiming 5 SDF fighters were killed. Local sources meanwhile stated that ISIL had withdrawn from most of its positions in Gharanij. U.S. DoD announced in February that ISIL brigade commander Aysh al Dagestani was killed in an airstrike near Kashmah on 12 January. ISIL captured Gharanij for the third time in three weeks from SDF following a counter-attack on 13 January. Meanwhile, pro-Kurdish and Coalition sources claimed 100 ISIL fighters had been killed during the overall battle for the town, while ISIL claimed 50-70 SDF fighters had been killed in the battle. Amaq stated that a VBIED in Gharanij on 14 January had killed and injured about 20 SDF fighters, while also stating that ISIL fighters killed 11 SDF fighters by targeting their positions through ATGM. Earlier, Kurdish sources claimed that the SDF had captured most of the town. On 16 January, it claimed killing of 10 SDF fighters in a VBIED attack in Gharanij. The car bomb forced SDF to retreat from some parts of the town, though retaining control of half of it. Pro-ISIL Wafa Media announced on 18 January that former German rapper Denis Cuspert had been killed by an airstrike during a battle in Gharanij. Cuspert was a fighter, recruiter and propagandist for ISIL. It released purported images of his corpse, stating he died on 17 January. The SDF announced it repelled an ISIL counterattack on their positions in al-Bahrah on 19 January, with its media center claiming 51 ISIL fighters were killed. Meanwhile, Amaq claimed 12 SDF fighters were killed in al-Baghuz Fawqani in southeastern Deir Ezzor and 11 in al-Shaafah, by ISIL fighters. The SDF claimed it controlled half of Gharanij on the next day and its media center stated that 151 ISIL fighters had been killed. Meanwhile, Amaq claimed ISIL killed over 30 SDF fighters in Al-Bahrah with a VBIED. The Coalition later stated that 145-150 militants were killed in US airstrikes on an ISIL headquarters near al-Shafaah on the same day. SDF claimed the capture of Gharanij on 24 January, and the killing of 7 ISIL fighters. On 26 January ISIL's Amaq News agency claimed ISIL had continued attacking positions of the SDF around al-Bahrah and east of al-Shaafah. ISIL's al-Naba'a newspaper claimed the killing of 185 SDF fighters and capturing of several positions in that past week in southeastern Deir-Ezzor. On the next day, Amaq claimed that ISIL had killed or injured 377 SDF fighters over that past week. On January 28 ISIL also attacked SDF positions around Gharanij including with a VBIED attack, which Amaq claimed killed 15 SDF fighters and destroyed two vehicles. After capturing Gharanij, the SDF in February shifted their attention to secure complete control of Al-Bahrah, whose control had changed twice. The capture of Alexanda Kotey and El Shafee Elsheikh, members of ISIL's cell called "The Beatles", was reported in February. The two had been caught a month earlier near Deir ez-Zor, in the Euphrates Valley. On 10 February, the SDF launched a new attack on al-Bahrah. Kurdish sources claimed they had captured some positions in the village, but there was no confirmation from the SDF itself. ISIL attacked SDF positions in al-Bahrah twice with VBIEDs on 10 February, resulting in dozens of dead and wounded in their ranks. Amaq claimed on 11 February that the SDF had been accidentally bombed by the Coalition during clashes with ISIL in al-Sosa area near Iraqi border. According to a source in Iraqi Popular Mobilisation Units (PMU) on 12 February, their forces had rescued 11 SDF fighters encircled by ISIL near the Iraqi-Syrian border. The SDF announced on 18 February that Sjoerd Heeger, a Dutch member of theirs, was killed fighting ISIL on 12 February. SOHR confirmed on 14 February that SDF had captured most of Al-Bahra. Syria's state-run news agency SANA claimed US airstrikes killed 16 people in al-Bahrah on 19 February and 12 in Hajin on 21 February. SDF announced it had captured al-Bahrah on 22 February, with its media center claiming 1,176 ISIL fighters were killed in the operation. SOHR stated that US airstrikes on al-Shaafah on 26 February killed 25 civilians. Amaq claimed that 13 SDF fighters were killed in an ISIL attack on their position northeast of the village of al-Shaafah on 28 February. The Pentagon acknowledged on 5 March that the Turkish military operation in Afrin had led to an "operational pause" in the offensive. A spokesman Major Adrian Rankine-Galloway stated that they had seen SDF fighters leave the offensive in Middle Euphrates Valley to fight elsewhere. On 6 March, the SDF announced that it had shifted 1,700 members from frontlines in the Middle Euphrates Valley to Afrin. On 1 May 2018, the SDF, backed by the US-led Coalition, and in coordination with the Iraqi Armed Forces, announced the restart of the offensive to clear the Iraqi-Syria border and middle Euphrates river valley of ISIL remnants, in what the Coalition called Operation Roundup. On 3 May, Syriac Military Council and SDF spokesperson Kino Gabriel stated that SDF forces had advanced 8 kilometers (4.97 mi.) into ISIL territory on the al-Bughuz axis along the Iraqi border near the Euphrates river valley. On 8 May, an official YPG Twitter account posted images of SDF forces using mine-resistant ambush protected vehicles (MRAPs) partaking in an assault on ISIL front lines. The vehicle was previously unauthorized to be provisioned to SDF forces; Pentagon spokesman Marine Maj. Adrian Rankine-Galloway confirmed to Military Times that the US is providing MRAPs to the Syrian Arab Coalition, which he called "an essential component of the SDF." On 10 May, Coalition forces announced the capturing of five senior ISIL commanders in a joint cross-border raid with SDF and Iraqi forces, in what Coalition officials called a "significant blow" to ISIL. The news prompted US President Donald Trump to announce on Twitter: "Five Most Wanted leaders of ISIS just captured!" By 13 May, the SDF had reportedly besieged and imposed full control over al-Baghuz Tahtani village – the first settlement seized from ISIL since the resumption of the desert offensive – on the east bank of the Euphrates, officially cutting access to the Iraqi border off for ISIL along the river. By 14 May, the SDF were conducting mine and tunnel clearing operations in al-Baghuz Tahtani as they had claimed to have taken a total of 64 kilometers of territory from ISIL. SOHR also reported that 18 ISIL fighters were killed in Coalition airstrikes in the town of al-Bahrah, further north along the river. Also on the same day, USCENTCOM commander Joseph Votel, Coalition commander Paul E. Funk II and other US personnel held a meeting with SDF leaders to "gain a better understanding of the fight against Daesh in the Middle Euphrates River Valley." On 17 May, after several weeks of clashes, the SDF captured a number of border posts near Abu Kamal, completely besieging ISIL's Middle Euphrates Valley pocket between SDF forces and Syrian Army forces. By 20 July, after a couple months of clashes, the SDF had fully cleared ISIL from the southeastern al-Hasakah countryside, significantly reducing ISIL's border region pocket to the eastern Deir ez-Zor Province. On 4 August, the SDF fully captured the remainder of ISIL's Iraqi–Syrian border pocket in the eastern Deir ez-Zor countryside, reducing ISIL's territorial control to a single pocket in the Middle Euphrates Valley, in the area between Hajin and Abu Kamal. The SDF subsequently began preparations for the third and final phase of the operation, while ISIL launched counter-attacks in the al-Malh oil well area. Experts considered it likely that Abu Bakr al-Baghdadi was hiding in this last pocket. On 10 September, the SDF began to advance from 4 different fronts towards the areas controlled by the ISIL – the pocket with Hajin, al-Susa, al-Shafa, and the neighboring villages straddling the eastern banks of the Euphrates river. On the following day, 11 September, the third and final phase of the operation officially commenced, under the code name of "Terrorism Defeat Battle". According to the SDF, the first defense lines of ISIL were broken on September 13. On 20 September, the SDF fully captured Al-Baghuz Fawqani and secured the destroyed bridge to al-Bukamal. On the same day, ISIL launched a counterattack targeting the SDF in Al-Baghuz Fawqani; in the counterattack, ISIL claimed to have killed 20 fighters from the Syrian Democratic Forces. On 25 September, the SDF captured the village of Ash Shājilah, north of Al-Baghuz Fawqani. The next day, ISIL conducted multiple SVBIED attacks on SDF positions in Al-Baghuz Fawqani, reportedly killing and injuring scores of SDF-affiliated Kurdish fighters, with a heavy firefight occurring soon after between ISIL and American-backed Kurdish forces in the town. Despite heavy resistance, the SDF continued to advance north of Al-Baghuz Fawqani and captured parts of al-Marashidah village, just southwest of al-Susah. On 10 October, ISIL launched a large counterattack under the cover of a large sandstorm, which resulted in the death of a French YPG volunteer, while they also managed to capture an MRAP-style vehicle from the Syrian Democratic Forces near the town of Baghuz Fawqani. On 12 October, ISIL continued its counterattack, which resulted in the killing and capturing of at least 45 SDF fighters, as well as the recapture of multiple positions. On 19 October, ISIL reportedly infiltrated and crossed through areas held by Syrian governmental forces and their allies, to reinforce its Euphrates pocket from the Syrian Desert. On 20 October, The Syrian Observatory for Human Rights claimed that the international Coalition had carried out two "massacres" via airstrikes in al-Susah, resulting in the deaths of 58, including 41 civilians, with ISIL only receiving 11–17 casualties in the strikes; 10 children were also reported to have been killed. On 22 October, the SDF launched a new assault on ISIL positions in al-Susah, resulting in half of the town being captured and al-Marashidah being cut off. They also disabled an ISIL SVBIED by killing the driver, reportedly with a sniper rifle. On 23 October, the SDF continued their advance after clashes continued through the night. ISIL attempted to counterattack and reportedly used 4 SVBIEDs on SDF positions in Susah. Under heavy air and artillery support, the SDF repelled the offensive and restarted the attack. In the morning, they took the village of Hawi al Susah, which is adjacent to the town of Susah. In Hajin, sporadic clashes continued between the two sides. On 24 October, fighting in Susah was still intense. Over the night, ISIL launched several assaults using armored cars and SVBIEDs to break through the encirclement of Marashidah, in which they still had fighters, and to push back the SDF before they can consolidate their positions. Under heavy artillery bombardment, they temporarily opened a corridor, which allowed some of their units to escape. The SDF claimed to have killed 10 fighters themselves, as well as destroying a vehicle and a SVBIED, while the Coalition reportedly killed another 41 ISIL militants with airstrikes and artillery. On the same day, the Coalition claimed on Twitter to have bombed a mosque in Susah that was being used by ISIL as a fighting position. On 27 October, ISIL launched a massive counterattack under the cover of a sandstorm, and managed to recapture parts of al-Susah, and they also reached the outskirts of al-Baghuz Fawqani. The SDF's Deir ez-Zor Military Council suffered heavy losses, and YPG units were moved to the frontline in order to stabilize the front. After even further setbacks, the SDF retreated from all captured positions in the Hajin pocket on October 28, effectively concluding their seven-week offensive without any gains. ISIL continued its counterattack on 29 October with the group retaking control of the towns of Marshidah, Mouzan, Safafinah, Shajlah, and Baghouz al-Fawqani as well as al-Susah from the SDF, forcing the Kurds to retreat after becoming overwhelmed. In response to the successful ISIL counterattack along the Iraqi-Syrian border, the Popular Mobilization Forces were deployed along the Iraqi side of the border in the Anbar Governorate, in fears of an ISIL cross-border infiltration. On Twitter, pictures from the town of Jabal al-Baghouz showed ISIL flags being raised in the town. Coalition spokesman Colonel Sean Ryan said that Coalition elements were helping "expedite" SDF reinforcement and resupply efforts, claiming that ISIL was making a "last stand" in the pocket. After skirmishes between Turkish Armed Forces and Kurdish elements in Kobanî and Tell Abyad, the SDF once again halted the offensive against ISIL. Despite the main offensive being on hold, on 6 November, the SDF Press Office announced that 49 ISIL fighters had been killed after the Islamic State launched attacks on the Hajin front that were repulsed within the previous 24 hours; three tunnels, 10 compounds, and a "bomb-laden vehicle" were all destroyed by the SDF. In addition, the Coalition bombed 27 targets. On the same day, the Iraqi Al Mada newspaper reported that the PMU had crossed into Syrian territory and seized 30 fortified border posts in areas previously abandoned by the SDF due to the 26 October ISIL counterattack. On 11 November, the SDF announced that they had restarted the offensive. During the intermediary period of halted ground operations, the Coalition continued a heavy bombardment campaign targeting ISIL fighting positions, tunnels, mortars, staging areas, and weapons caches. It was alleged that individual houses of ISIL commanders were being given out by spies, as well as locations of weapons caches, and that ISIL had executed a civilian on charges of being a spy, but this was not confirmed by any official source. On 23–24 November, around 500 ISIL fighters took advantage of foggy, low-visibility weather to attempt a breakout of the Hajin pocket, by launching a "broad" counterattack north of Hajin towards al-Bahrah, Gharanij, and the al-Tanak oilfield, killing at least 47 SDF soldiers - 29 on Saturday alone – in the assaults; in turn, 39 ISIL militants were killed in both ground clashes and Coalition airstrikes. The village of al-Bahrah was reportedly captured by ISIL, while the other two assaults were repelled. The SOHR added that Coalition air raids also killed 17 civilians – including five children – during the clashes. Coalition spokesman Sean Ryan denied receiving reports of civilian casualties and that close air support had been "very limited" due to bad weather. Furthermore, ISIL claimed to have captured at least 10 SDF fighters – including a commander – during the counterattack, with the group subsequently releasing images and video to corroborate the claim. By 26 November, as ISIL fighters had largely retreated back to their previous positions after Coalition-supported SDF push back, the fighting had reportedly killed over 200 people as more bodies were recovered on the 25th. SOHR reported 51 civilians had been killed and 92 SDF fighters were killed in the weekend fighting, the "largest number of SDF fighters killed (by IS) in a single battle since it was founded". On 3 December, local activist sources reported that SDF forces had advanced on ISIL's de facto capital of Hajin and had broken into the town after overrunning ISIL defenses on its northwestern flank from al-Bahrah. By 4 December, SDF forces had reportedly advanced into the northern sector of Hajin, capturing the local hospital and the al-Hawamah neighborhood and market area. On 6 December, Redur Khalil, an SDF commander, confirmed their forces had broken into Hajin and had taken portions of the town, including some neighborhoods and a mosque, but not the hospital, amidst ongoing heavy clashes. By 7 December the SDF had taken about half of the town and had also opened a humanitarian corridor for Hajin, allowing over 1,000 civilians – mostly women and children – to flee ISIL's embattled capital. The Coalition stepped up airstrikes to support the SDF's advance, with a 5 December press release detailing multiple strikes conducted near Hajin targeting ISIL supply routes, tunnels, fighting positions and trucks. Syrian state media claimed a Coalition airstrike in Hajin on 7 December completely destroyed the local hospital along with killing eight civilians, all from the same family. The Coalition denied civilian casualties in their airstrikes and disputed that the hospital was destroyed. On 11 December, Coalition spokesman Col. Sean Ryan confirmed to Talk Media News that the Hajin hospital was not bombed on 7 December and that SDF units began receiving small arms fire from ISIL elements on the second and third floors of the facility on 8 December as it was being used as a "command and control node" by the terror group due to its strategic location. The next day an explosion occurred at the building, to which the Coalition claimed was the result of rigged explosives placed by ISIL; when SDF units captured the hospital on 10 December, they reported the building was "heavily mined with IEDs" in the remaining structure. On 11 December, the SDF, along with reversing some of ISIL's recent gains and making fresh advancements in Hajin, managed to recapture the border town of al-Baghuz Tahtani, securing the entire Syrian-Iraqi border once again and regaining much of the lost territory from the October ISIL counterattacks. By 12 December, the Coalition estimated there were still 2,500 of the "most hardened" ISIL fighters in the Hajin holdout. US Special Presidential Envoy to the anti-ISIL Coalition Brett H. McGurk said "We've gotten to a point where almost every ISIS fighter is wearing a suicide vest, the extent of IEDs and placements, it's very, very difficult fighting and so it's taking some time." Since the initial break-in of western Hajin, recent SDF front line advances in the town had been modest and methodical as ISIL reportedly had placed many mines and IEDs in residential areas, dug an extensive tunnel network, and had snipers placed in taller buildings – along with reportedly using stranded civilians as human shields, according to SDF fighters on the ground. Furthermore, 2,500 civilians had by now fled towards SDF territory as the SDF reported to have killed 55 ISIL militants since entering Hajin. By 13 December heavy clashes continued in the town center as Coalition airstrikes continued to bombard ISIL positions. As the SDF advanced, capturing two more hospitals in the process, ISIL detonated 5 booby trapped vehicles in an attempt to hinder SDF progress, but the traps failed. Later in the day, SOHR and local unofficial sources reported that Islamic State defenses in Hajin had collapsed and the jihadist forces were fleeing to the stronghold's eastern outskirts; Kurdish Twitter accounts showed the SDF flag perched atop the main bazaar, signaling the SDF had indeed captured the town center. By dawn on 14 December, SDF forces – spearheaded by the Kurdish YPG – fully captured Hajin as ISIL defenses collapsed, due to an intensified ground push supported by increased Coalition airstrikes. The capture of Hajin town proper deprived the Islamic State of a significant command and control hub, and the terror network's last chunk of significant urban territory; ISIL's battered militants, aided by tunnel networks, withdrew south to the rural village areas east of the Euphrates river and west of SDF positions along the Iraqi border. SDF spokesman Mustafa Bali confirmed that sporadic pockets of ISIL elements were still harassing and counterattacking Hajin post-capture in the surrounding fields and outskirts and that the fight for the town was "difficult" as the entrenched ISIL fighters the SDF besieged were hardened veterans from Iraq and Syria "fighting to the death", putting up stubborn resistance and stiff defenses. Europe-based Syrian opposition activist Omar Abu Layla claimed that disagreements among ISIL ranks over hierarchy between Iraqi and Syrian fighters helped "speed up the collapse" of the extremist group's defenses in the town. SOHR added that since the launch of the third phase of the Deir ez-Zor campaign on 10 September, 922 ISIL gunmen, 539 SDF fighters, and 324 civilians – of which were 113 children and 72 women – had died in the deadly fighting for the enclave. SOHR continued that the majority of the civilian casualties were from international Coalition airstrikes. With the capture of the Hajin stronghold – the Islamic State's last de facto capital – on 14 December, ISIL fighters retreated to the remaining rural villages still under their grasp within the pocket. SDF commander-in-chief Mazlum Kobane said that at least 5,000 ISIL fighters were still in the remaining pocket. He said about 2,000 are foreign members, mostly Arabs and Europeans with their families. The U.S. estimated there were still a diehard contingent of 2,500 ISIL fighters entrenched within the remaining enclave as the Islamic State still controlled the villages of Al-Susah, Al-Marashidah, Al-Shaafah, al-Baghuz Fawqani, al-Shajla and surrounding settlements. It was reported that more than 700 prisoners including deserters were executed by ISIL since it lost Hajin. On 14 December, SDF forces reportedly advanced south of Hajin, pushing towards the towns of Abu Hassan and Abu Al-Khatir amidst ongoing clashes. It was also reported that ISIL was attempting to break through SDF defenses and retake Baghuz Tahtani, in the southern sector of the pocket, on the Iraqi border. By 21 December, after capturing the al-Qal'ah area southwest of Hajin, SDF troops reportedly made a major advancement in the town of Abu al-Khatir, as Coalition airstrikes pounded ISIL units and forced them to fall back to the town center. Local sources also reported that ISIL had made Al-Susah its new headquarters. On 25 December, local sources confirmed the SDF had taken the key town of Abu al-Khatir after days of clashes, with the help of continued Coalition airstrikes, securing an adequate buffer zone around Hajin; subsequent clashes were reported in Abu Hassan as the SDF continued its advance southward, down the Euphrates. The SOHR reported that the SDF had rounded up 262 ISIL militants trying to flee among the civilian exodus from the region by 25 December; 5,500 civilians had so far reportedly fled the pocket since the announcement of the withdrawal of US troops from Syria on 19 December. Local activist sources reported on the 28th that the SDF had captured half of Al-Kashmah with ISIL still occupying the southern half; capturing Al-Kashmah would put the SDF within adequate striking distance of Al-Shaafah for the first time. The SDF made limited advances on the Al-Kashmah front and the al-Susah axis against ISIL forces by 30 December, with SDF contact lines reportedly reaching near the immediate eastern outskirts of al-Susah, while the SDF controlled around 70 percent of Al-Kashmah, with fierce clashes raging. By 31 December, the SDF had fully captured Al-Kashmah and were fighting for control of Al-Shaafah, the last major town from the northern approach before ISIL's Al-Susah. On 5 January 2019, two British special forces soldiers (presumably from the Special Air Service) were injured in an attack carried out by ISIL; one Kurd also died. US troops evacuated the two soldiers. On 7 January, the SOHR reported that ISIL units took advantage of bad weather and launched a counteroffensive against the SDF in the pocket, killing 23 and wounding others, while ISIL suffered 9 casualties. By the next day, the SDF had repelled the offensive and had gained more ground from ISIL near the Iraqi border. On the same day, Coalition warplanes and artillery continued to bombard the town of Al-Shaafah, as the SDF continued its approach towards Al-Susah. On 9 January the SDF released images of eight foreign ISIL fighters their units had captured during a recent "special operation". The captured included Russian, German, Uzbek, Tajik, Ukrainian and Kazakh nationals, as well as an American teenager. On 10 January the SDF reportedly fully captured Al-Shaafah after expelling ISIL fighters in a counterattack. The SDF continued to advance on the Abu Badran area. With continued US and French airstrikes in support, SDF forces reportedly captured most of Abu Badran after overrunning ISIL defenses in the northern portion of the village on 13 January. After the recent gains in the pocket against ISIL and ramping up their attacks in the previous two days, SDF spokesman Mustafa Bali told Reuters that ISIL "are living the final moments and realize that this battle is the battle to eliminate them." On 15 January, the SDF's Deir ez-Zor Military Council, the spearheading fighting force during the campaign, launched a final major push south to storm al-Susah, after capturing Abu Badran and the al-Ulay'at region from ISIL forces. At the time, it was believed that ISIL's central command was headquartered at al-Susah and that their leader Abu Bakr Al-Baghdadi may also potentially be held up there. On the same day, reports emerged – particularly from the SOHR – that the SDF had already pushed ISIL out of al-Susah, but this was not confirmed by the SDF or the Coalition. Frontline reports confirmed the SDF had fully taken al-Susah by 17 January, with ISIL combatants ultimately retreating further southward to avoid being overrun. The loss of al-Susah was a heavy blow against the Islamic State, as the terrorist organization's territorial control in the pocket had dwindled to four key towns: Al-Marashidah, Mozan, al-Shajlah, and as-Safafinah (though clashes still continued at Al-Baghuz Fawqani). Following the capture of al-Susah, reports emerged of shelling in al-Marashidah and of ISIL targeting SDF units in al-Susah with VBIEDs. On the next day, the SDF's media center released a report detailing their recent engagements. Under near-constant Coalition air support, SDF fighters advanced 1.5 km, capturing 32 new points on a secondary front line of the Al-Susah axis, leading to separate heavy clashes with ISIL, in which SDF troops seized ammo and weapons from slain ISIL fighters, including SDF troops detonating four ISIL motorbikes loaded with explosives. Afterward, ISIL once again took advantage of bad weather and launched raids on SDF frontline positions, but were repelled. The SDF reported that 88 ISIL fighters had been killed, while they lost 10 of their own fighters with an additional 30 wounded. On 20 January, the SOHR reported that Coalition airstrikes on Al-Baghuz Fawqani had killed six civilians, including four children, as well as killing 10 ISIL militants. Coalition airstrikes reportedly intensified after the ISIL-claimed Manbij bombing that claimed the lives of four Americans. The SDF fully overran and recaptured al-Baghuz Fawqani on 23 January, after weeks of desperate ISIL resistance there ended with the collapse of their forces; the SDF promptly began mine-clearing and sweeping operations in the surrounding farms and communities, to find any hiding enemy militants. The capture of Baghuz Fawqani prompted the SOHR to proclaim the imminent defeat of ISIL in Deir ez-Zor, with the jihadist group only possessing 10 square km of remaining territory in the Middle Euphrates Pocket, and the remainder of their die-hard combatants holed up in scattered homesteads among the irrigated fields and orchards on the north bank of the valley. The US-led Coalition declined to say when it expected the SDF to capture the last chunk of ISIL territory, with spokesman Sean Ryan instead emphasizing that the bigger goal of the operation was to minimize and degrade ISIL's insurgency and terror capabilities by depriving them of physical space to operate. "We try to stay away from timelines as it is more about degrading the enemy's capabilities," Ryan said. On the same day, the villages of as-Safafinah and al-Shajlah were also reported to have been overrun by the SDF backed by heavy French and American shelling, leaving al-Marashidah as the last stronghold in ISIL's grip – merely 0.01 percent of the territory its self-proclaimed caliphate once held. On 24 January, SDF forces began swiftly crossing the northern bridge into al-Marashidah – ISIL's final stronghold – forcing ISIL to withdraw towards the center of the town. In response, ISIL launched a counterattack and regained parts of al-Shajlah before the attack was repelled. By the next day, another counterattack allowed ISIL to regain parts of western Baghuz Fawqani, to the south of the area, with ISIL attempting to break the SDF's siege with suicide attacks. During ISIL's attempted breakout, Syrian Arab Army units that had deployed across the river targeted the Islamic State's poorly established positions at the town as well, indirectly assisting the Kurds. 35 ISIL fighters were killed and another 21 captured during the failed breakout attempt; in turn, 16 SDF fighters were killed and at least 30 were injured. At this point, SDF commander Mazloum Kobani predicted that the SDF would complete their campaign and end ISIL's military presence within a "month", only declaring victory after asserting control over the captured lands. On 25 January, ANHA reported that 150 ISIL fighters surrendered to the SDF in al-Baghuz Fawqani, with most of them being foreign fighters. The front lines at Baghuz Fawqani remained fluid on the 26th as Coalition bombardment continued on the village with ISIL continuing stiff resistance in south Marashidah as units from the Free Syrian Army's Kurdish-aligned Northern Democratic Brigade reportedly clashed with ISIL in northern Marashidah. Reports also emerged that an ISIL commander named Bashar Al-Mughbel was killed in Coalition airstrikes in Baghuz Fawqani as SOHR reported that Coalition air raids and short-range missile strikes on hamlets and other civilian areas had killed 42 people in the pocket in recent days, including 13 civilians consisting of seven Syrians linked to ISIL – including three children from the same family – and six Iraqi non-combatants. Overnight clashes between the 26th and 27th killed 19 ISIL and 11 SDF fighters, SOHR reported, adding that the aerial bombardment was some of the fiercest in two weeks. Additionally, 4 SVBIEDs targeted SDF positions when ISIL mounted another counterattack to break the siege. By 27 January it became clear that Kurdish and US officials did not believe ISIL's leader Abu Bakr al-Baghdadi was still holed up in the pocket. “He would have to be stupid to stay in the last pocket until the end,” SDF spokesman Zana Amedi said. “He would have escaped a long time ago before the situation deteriorated for them so much. He’s not dead, and he’s not in these villages, either.” On 28 January the SDF managed to capture parts of northern Al-Marashidah and besieged ISIL within a space of only 4 square kilometers of land, boxing them up against the Euphrates. As clashes continued, SDF commander Heval Roni commented, "Geographically speaking, there are only four square kilometres left under IS control, stretching from Baghouz to the Iraqi border". He also stated that the dwindling number of remaining ISIL officers and commanders were mostly Iraqi. Meanwhile, SOHR reported some 2,000 people, including 300 ISIL gunmen, had fled the area since the 27th; among the commotion, the SDF captured a local ISIL commander and a body guard. By 28 January, ISIL was reported to have parts of al-Marashidah, al-Arqoub, Safafinah, and Baghuz Fawqani villages still under their control, as well as some orchards in the town of Al-Susah. On 29 January, SDF spokesman Mustafa Bali told Reuters that instead of an all-out storming of the last bastion of ISIL territory, the SDF's advance had slowed due to the large presence of civilians, many of whom were wives or children of ISIL fighters. Bali added that they were conducting "precise operations", which took more time. He added that the SDF had also refused an offer from the jihadists via mediators to surrender the territory in return for safe passage out. The International Rescue Committee charity organization said it was helping tend to a sudden influx of more than 10,000 people, almost all of whom were women, children, and elderly people, who had arrived at an internally displaced persons camp in Al-Hawl in northeastern Syria, since the previous week. The IRC said most of them were exhausted, extremely hungry, and thirsty as they fled ISIL territory, with many arriving barefoot. Meanwhile, acting U.S. Defense Secretary Patrick M. Shanahan stated that the remaining territory will be taken in a few weeks. On 30 January, it was reported that a Coalition air raid over Marashidah killed Mohammed Mahmoud al-Abadi (Abu Osama al-Qurashi), a senior ISIL figure that held several positions in the Islamic State, including commander of the “Islamic Police”, Minister of Oil, and senior security commander. Meanwhile, the Kurdistan Region's Special Office for Yezidi Abductees Affairs reported that SDF units had freed three Yazidi prisoners from ISIL – aged 12, 30, and 40 – during their ongoing conquest against ISIL. Islamic State jihadists reportedly abducted these women when they entered the Sinjar region in 2014. On 15 January an Iraqi official stated that ISIL elements were still trafficking Yazidi women across Iraq and Syria despite the collapse of their "caliphate". On 31 January, the SDF made limited advances between Safafinah and Baghuz Fawqani while also advancing on Arqoub (western Marashidah), a strategically important sector for ISIL as they've used the bridge there to cross the river to escape to their refuge in the Syrian desert. Later, the SDF pulled back from some areas of Baghuz Fawqani to avoid harming civilians. More than 150 people were rescued. By the end of the month, ISIL reportedly still controlled Baghuz Tahtani on the Iraqi border as well after an SDF tactical retreat. With the large number of civilians fleeing the war zone, the SDF had significantly slowed down their advance by February 1, in fear of ISIL using non-combatants as human shields. SDF-ISIL clashes in the pocket also decreased in intensity as ISIL tried to negotiate for a safe passage to evacuate towards the Turkish border. The SDF and the Coalition rejected this, instead demanding a full surrender from the remaining jihadists and their commanders. Meanwhile, it was reported that after the previous ISIL commander was killed, a Saudi named al-Jazrawi was in command of the remaining pocket. During this lull in ground clashes, civilians continued to leave ISIL areas in droves with SDF and American SOF soldiers handing out water, nappies and MREs to the families of ISIL members and other civilians at makeshift screening centers set up to help process the outflow of people; among the often haggard, famished, and dust-covered IDPs, males were screened separately in search of fleeing ISIL militants, who were known to be mixing in with the innocent civilians. In the early morning of 5 February, 5 Turkish families surrendered themselves along with other women and children. On February 6, 12 Iraqi families, 14 Syrian families, four Azerbaijani families, and two Canadian women surrendered themselves to the SDF. Five ISIL child soldiers aged between 14 and 15 also surrendered. Meanwhile, the Coalition carried out two airstrikes on Baghuz Fawqani after an Iraqi drone was shot down, in the first airstrikes in days. On 6 February, US President Donald Trump, while at a summit of 79 foreign ministers and officials that have partaken in the global coalition against ISIL, predicted a formal announcement of a final victory against ISIL as early as the upcoming week despite front line advances recently being halted. "Remnants - that's all they have, remnants - but remnants can be very dangerous," Trump said in regards to ISIL. "Rest assured, we'll do what it takes to defeat every ounce and every last person within the ISIS madness". In regards to captured militants, SDF spokesman Mustafa Bali said that the SDF is detaining foreign ISIL fighters on a "daily basis." Suspected militants captured by the SDF are usually eager to be sent home, something the Kurdish administration also wants. Human Rights Watch has warned that any transfers of suspected foreign militants and their relatives out of Syria should be a transparent process. On 7 February, the SDF captured Al-Marashidah and its western district of Arqoub, as well as other areas nearby, completely besieging the remaining ISIL fighters in the town of Al-Baghuz Fawqani, to the south of Al-Marashidah. Later on the same day, SDF commander Adel Cudi stated that the SDF controlled 80% of Baghuz Fawqani and were advancing slowly against the last ISIL-held positions. Late on 8 February, Mustafa Bali said that the SDF would launch a final assault on the remainder of the enclave once civilians had been completely evacuated. "There is of course a safe corridor and civilians are coming out daily, and this reduces their number in Baghouz until we can be sure the town is free of civilians," Bali said. "We will launch an attack to end the Daesh presence or they will turn themselves in. There are no other options for them. We confirm there are no negotiations and no intention to have negotiations," he added. On the evening of 9 February, the Syrian Democratic Forces announced that they were launching the final "decisive" battle, after nearly ten days of evacuating 20,000 civilians, most of whom were ISIL family members. Redur Kalil, the SDF's senior public relations officer, told The Times newspaper that a number of foreign hostages were possibly being held in the enclave. The operation began with a heavy preemptive bombardment during the afternoon, from the SDF missile and mortar teams and Coalition warplanes. The Coalition estimated ISIL still had around 1,000–1,500 of its most loyal jihadist fighters still fighting within the enclave, though the SDF and SOHR estimated that ISIL still had around 3,000 fighters within the enclave. Between 9–10 February, the SDF was able to capture a total of 2 square kilometers and seized control of 41 tactical points. The SDF reported the deaths of 37 ISIL members, along with the destruction of 19 locations, one enemy motorbike, four roads, one mortar, and one weapons cache in the preemptive airstrikes leading up to the assault, while only losing two of their own. The Syrian government claimed the recent airstrikes had killed several civilians, including four people near a makeshift refugee camp near Baghuz. On the morning of 11 February, the SDF repelled another ISIL counterattack, as another 1,500 civilians fled the area in a column of 17 trucks filled with men, women, and children, some identifying as Iraqi. The SDF advance was gradual and precise, as hundreds of civilians continued to stream out of the war zone into SDF-Coalition screening centers, set up to filter out fleeing jihadists. On 12 February, SDF spokesman Mustafa Bali announced that ISIL had only control over 1 square kilometer of territory, and that all those remaining in the area were ISIL militants and their families. On 16 February, one week into the battle, SDF commander Jiya Furat stated that the besieged pocket was reduced to an encircled 700 square meters and that a declaration of victory against ISIL in the pocket was soon to come. The battle had stalled into a standoff by late February, as the SDF chose to wait until every possible civilian fled the remaining territory before storming it, delaying declaration of victory and extending the battle into a protracted siege. Attrition became a larger factor as the surrounded jihadists were letting their families, other hostages, and more expendable fighters leave due to dwindling food resources from the SDF's encirclement, with hundreds of civilians and dozens of surrendering militants regularly flowing out of the enclave. The evacuees included shattered families that lost loved ones and wounded, exhausted and hungry men, women, and children. A number of the fleeing wives were interviewed by international media, giving accounts of their journey to and conditions under ISIL's "caliphate", some describing how they lived in dug-up holes with hoisted tents to protect against airstrikes. While some were more critical, others proclaimed their continuing devotion to the idea of the Islamic State, even after surrender. "We weren't going to leave, but the Caliph said women should leave," said one mother, referring to ISIL leader Abu Bakr al-Baghdadi supposedly ordering women and children to leave. "I wanted to stay. It is an Islamic State. It is land of Islam," she added. SDF officials have denied they are negotiating with ISIL, but Coalition spokesman Sean Ryan confirmed on 6 March that negotiations were taking place, through which the SDF was "diligently" trying to find out information regarding any hostages held by ISIL. By 9 March, one month into the protracted battle/stand-off, many evacuating ISIL militants and their families remained unrepentant and devoted to the "caliphate". Around two dozen interviewed evacuees described their last days in the besieged camp and how ISIL's Hisbah religious police continued to maintain order and religious enforcement in the camp amidst SDF-Coalition encirclement. The Hisbah oversaw the civilian evacuations from ISIL's end, seeing the SDF's evacuation attempts as facilitating their longevity. According to media reports, a number of the evacuees sometimes berated and harassed reporters and photographers at evacuation areas. Others spoke about their situation; many were still devoted to ISIL and hoping for future "conquests", while some were more ambivalent. They saw the caliphate's collapse as punishment from God due to corruption among ISIL leadership and officials. On 17 March, the SDF released their figures on the operation since 9 January: 34,000 total civilians evacuated, 29,600 ISIL fighters and their family members surrendered, including more than 5,000 fighters, 1,306 ISIL militants killed, and 520 captured in operations. In turn, they put their casualties at 11 dead and 61 injured. On 23 March, the SDF announced full liberation of ISIL's enclave, concluding the battle of Baghuz Fawqani and capping off the campaign. The whereabouts of ISIL's leader Abu Bakr al-Baghdadi remained unknown as the SDF transitioned into counterinsurgency operations. During the night of 7 February 2018, US forces attacked positions of pro-Syrian government forces with airstrikes, following a pro-government incursion on the frontline with the SDF, claiming it was out of self-defense of an SDF headquarters with US observers in Khusham. US officials estimated that more than 100 members of the pro-government forces were killed. Russian Ministry of Defense however claimed that the pro-government forces were conducting reconnaissance missions against ISIL. An injured pro-government fighter also claimed that SDF forces had infiltrated during the airstrikes in Tabiyyah region but were repelled. There were also reports by pro-opposition sources that clashes had erupted between SDF and SAA and allied pro-government forces. Pro-government Al-Masdar News downplayed these claims and suggested they might have been a scare campaign led by opposition media. On 29 April 2018, the Syrian Army launched an assault on four SDF-held villages on the eastern side of the Euphrates River, initially capturing them. According to the Syrian Observatory for Human Rights (SOHR), nine pro-government and six SDF-affiliated fighters were killed in the clashes. SDF spokesperson Kino Gabriel claimed that the clashes were "supporting terrorism and an attempt to obstruct the war against terrorism". Several hours later, the SDF claimed they recaptured all of the villages they lost, Some local sources claimed that US-led coalition jets hit pro-government forces attacking the SDF, although the Pentagon stated they only conducted warning airstrikes and did not hit the pro-government troops directly. On 5 November 2018, the United States's Department of Defense Inspector General determined that ISIL had evolved into "an effective clandestine" insurgency force operating largely underground in both Iraq and Syria as it lost all territory in Iraq and only possessed 1 percent of Syrian territory at the time. The large scale simultaneous campaigns by the majority-Kurdish Syrian Democratic Forces, the Syrian government, and the Iraqi government to incrementally wrest territory from the Islamic State degraded the terror group's ability of power projection and access to the resources and manpower it once took advantage of years prior. As ISIL lost more and more territory in both Iraq and Syria and became cornered in small pockets of territory such as in al-Safa in the Syrian Desert and in the Hajin-Euphrates pocket, the veteran remnants of the group, as is seen with many organizations that utilize guerrilla warfare tactics and strategy, became increasingly dependent on insurgent strategies rather than the previous grand offensives it was able to conduct. As well as bolstering its propaganda efforts, many scattered ISIL fighters and loyalist sleeper cells melted into the local populace and continued terror bombings and attacks, prompting major counterinsurgency operations. On 17 January 2019, the SDF – after nearly capturing all of ISIL's Euphrates pocket – said, "With the help of the (U.S.-led) coalition, we will escalate our military operations to eliminate Daesh remnants and chase down their sleeper cells," asserting their readiness to wage counterinsurgency operations against the Islamic State post-campaign. On 29 January the US Director of National Intelligence Dan Coats released his Worldwide Threat Assessment, stating that ISIL "very likely will continue to pursue external attacks from Iraq and Syria against regional and Western adversaries, including the United States." With the terror group's loss of physical territory, "ISIS will seek to exploit Sunni grievances, societal instability, and stretched security forces to regain territory in Iraq and Syria in the long term," returning to its "guerrilla warfare roots while continuing to plot attacks and direct its supporters worldwide". The assessment added that it did not expect the Assad government to focus on clearing ISIL from Syria post-US withdrawal. On 21 February, 2019 an Iraqi official stated that the SDF had transferred 150 ISIL militants to Iraqi authorities under a deal involving a total of 502, making it the single largest repatriation of ISIL members thus far. On 24 February, the Iraqi Government stated that they received 13 more ISIL suspects from the SDF. Some Iraqi officials stated that all 13 were of French origin. The Syrian Democratic Forces released 283 Syrians that were held for ISIL affiliation on 3 March. SDF authorities said the freed "have no Syrian blood on their hands," suggesting that they did not take part in any fighting. The move came after lobbying from tribal chiefs and other local officials. On 20 April, Kosovo repatriated 110 of its citizens from Syria, including 72 children, 32 women, and four men suspected of fighting for ISIL. The men were arrested upon arrival back into the country. They flew back with the help of the U.S. military before police escorted them to an army barracks near the capital, Pristina. On the same day, Bosnia announced that it had repatriated and detained a Bosnian national suspected of fighting for ISIL. ^ "RAF air strikes in Iraq and Syria: September 2017". GOV.UK. Retrieved 10 July 2018. ^ "Point de situation des opérations du 22 février 2018". 2018-02-22. ^ "Militaire bijdrage Nederland in Irak en Oost-Syrië". Netherlands Ministry of Defence. ^ "YPG announce defeat of ISIS east of Euphrates". Rudaw. 3 December 2017. ^ "Von USA fallengelassen: Russland unterstützt kurdische YPG-Miliz in Ostsyrien". RT Deutsch. 5 December 2017. ^ a b c d "U.S.-backed Syrian forces resume battle against Islamic State". Reuters. 1 May 2018. ^ a b c BBC Monitoring (11 October 2018). "Explainer: IS redraws boundaries of its local Syrian 'branches'". BBC. Retrieved 16 November 2018. ^ "SDF announced 'Terrorism Defeat Battle' as part of al-Jazeera Tempest campaign - ANHA - Ajansa Nûçeyan a Hawar". Hawar News. 11 September 2018. Retrieved 11 September 2018. ^ a b "Turkish attacks in Syria prompt SDF to halt to fight against Daesh". 31 October 2018. Retrieved 31 October 2018. ^ a b "SDF halts offensive against ISIS after Turkish attacks". Retrieved 31 October 2018. ^ "Al-Jazeera Tempest progress outcome in a month - ANHA". en.hawarnews.com. Retrieved 29 November 2017. ^ a b "Turkish offensive in Syria leads to pause in some operations against IS: Pentagon". Reuters. 6 March 2018. ^ Press, Associated (6 March 2018). "Battle against Isil 'paused in Syria' as Kurdish fighters battle Turkey". Retrieved 10 July 2018 – via www.telegraph.co.uk. ^ "Web & Mobile". 27 February 2012. Retrieved 10 July 2018. ^ a b Leith Aboufadel (4 August 2018). "ISIS fully expelled from Syria-Iraq border". Al-Masdar News. Retrieved 4 August 2018. ^ "Battered ISIS Keeps Grip on Last Piece of Territory for Over a Year". New York Times. 9 December 2018. ^ Aboufadel, Leith (10 December 2018). "SDF troops score important advance against Daesh near Iraqi border". Retrieved 15 December 2018. ^ a b EA Worldview (15 December 2018). "Syria Daily: Kurds-Led SDF Close to Taking Last Key ISIS Town". Retrieved 15 December 2018. ^ "UK hit ISIS with 10 airstrikes during Christmas period". The National. ^ a b c "U.S.-backed forces to attack Syria's Deir al-Zor soon: SDF official". Reuters. 25 August 2017. ^ a b "Military police of SDF arrest leader of al-Bakkara Youth Gathering Yasser al-Dahla, the defected of Syrian Elite Forces". Syrian Observatory for Human Rights. 2 October 2017. ^ "Yasser Al-Dahleh, with audio and video, refutes what the media has announced about his break-up and adherence to the regime". Xeber 24. 9 December 2017. ^ "YPJ Commander: We will reach the Euphrates River soon". ANF News. 11 September 2017. Retrieved 12 September 2017. ^ "Rojda Felat: by women's leadership, historic victory achieved in al-Raqqa". Hawar News Agency. 20 October 2018. Retrieved 22 November 2018. ^ Rami Zien (13 September 2017). "Blast Kills and Injures Dozen of SDF Troops Including a Senior Commander". Qasioun News. Retrieved 13 September 2017. ^ a b Eric Schmitt; Rod Rordland (28 February 2018). "Amid Turkish Assault, Kurdish Forces Are Drawn Away From U.S. Fight With ISIS". The New York Times. Retrieved 28 February 2018. ^ a b "Syriac commander: Our forces effectively participate in al-Jazeera Tempest". Hawar News Agency. 30 November 2017. Archived from the original on 1 February 2018. ^ a b Agiri Ibrahim (5 October 2017). "NATURO participate in al-Jazeera Tempest". Hawar News Agency. Archived from the original on 19 October 2017. ^ a b Francesco Bussoletti (29 June 2018). "Syria, the Isis pockets of resistance at Deir Ezzor are reduced to two". Difesa & Sicurezza. Retrieved 6 July 2018. ^ a b ~ Joško Barić (2019-01-30). "Syrian War Daily – 30th of January 2019". Syrianwardaily.com. Retrieved 2019-03-26. ^ "(IS) Group senior leader fled to Al-Hasaka". El-Dorar Al-Shamia. 3 October 2017. Retrieved 5 October 2017. ^ a b c d Jeff Pegues (10 May 2018). "5 top ISIS leaders captured in latest blow to militant group". CBS News. Retrieved 7 July 2018. ^ "Illiterate IS amir narrated his story of joining IS -1". Hawar News Agency. 8 October 2017. Retrieved 8 October 2017. ^ a b c "Mastermind of 2016 ISIS attack on Qamishli killed in special op: YPG". Rudaw Media Network. 1 January 2018. Retrieved 11 January 2018. ^ "Military operations continue against IS leaders". Kuwait News Agency. 2 February 2018. Retrieved 9 February 2018. ^ "Infamous ISIS commander killed in eastern Deir Ezzor". 21 October 2018. Retrieved 31 October 2018. ^ Francesco Bussoletti. "Syria, some Isis chiefs killed at Deir Ezzor. Are Sand Hippos already in action?". Difesaesicurezza.com. Retrieved 2019-03-26. ^ a b c d e f g h "El Pentágono informa de la muerte de seis presuntos líderes del EI en Siria" (in Spanish). La Vanguardia. 2 February 2018. Retrieved 9 February 2018. ^ Thomas Joscelyn (19 June 2018). "US-led coalition targets Islamic State's oil and gas network". Long War Journal. Retrieved 22 June 2018. ^ a b c d "MDC declared "al-Jazeera Tempest" campaign". Hawar News Agency. 9 September 2017. Archived from the original on 11 November 2017. Retrieved 13 September 2017. ^ a b Aymenn Jawad Al-Tamimi (28 September 2018). "Hajin in Deir az-Zor: Interview". Retrieved 20 February 2019. ^ "Spanish warrior fighting with Syrian Kurds killed in battle against IS". Ekurd. 28 May 2018. Retrieved 16 March 2019. ^ RojavaCudi. "Rojava Resistance on Twitter: "Video of #SDF forces (YPG/J and al Sanadid) clashing with #ISIS and calling in airstrikes north of Hajinâ€Ś "". Twitter.com. Retrieved 2019-03-26. ^ Etienne Monin (18 February 2019). "Des civils quittent Baghouz, dernier réduit du "califat" : "Si tu es passée par ici, tu es sur la liste noire pour le reste de ta vie"" [Civilians leave Baghouz, the last cut of the "caliphate": "If you've been here, you're on the black list for the rest of your life"]. Radio France (in French). Retrieved 18 February 2019. ^ "‫قواتنا تتمكن من تفجير سيارة ذخيرة لداعش في دير الزور 24/2/2019‬‎". YouTube. 2019-02-24. Retrieved 2019-03-26. ^ a b c ""We will withdraw our forces from east of Euphrates, send them to the fronts of Afrin"". Hawar News Agency. 6 March 2018. Archived from the original on 8 March 2018. ^ "Self-Defense Duty fighters: we willingly join al-Jazeera Tempest". Hawar News Agency. 20 September 2017. Retrieved 22 September 2017. ^ "A thousand civilians rescued in Deir ez-Zor operation". YPG. 22 September 2017. Retrieved 22 September 2017. ^ Alexander Falconer (3 June 2018). "SDF Takes Control of Broad Area Near Iraqi Border With Help From PM". El-Dorar Al-Shamia. Retrieved 13 September 2018. ^ a b c "After carrying out the first massacre by the International Coalition since the start of "Jazeera Storm" Operation, Deir Ezzor Military Council continues its operation to control al-Shehabat area". SOHR. 13 September 2017. Retrieved 13 September 2017. ^ "SDF militias Finishing up preparations to attack Deir al-Zour". El-Dorar Al-Shamia. 7 September 2017. Archived from the original on 12 September 2017. Retrieved 9 September 2017. ^ "Two British soldiers injured in Islamic State attack in Syria - BBC News". Bbc.com. Retrieved 2019-03-26. ^ "Two British soldiers seriously injured in Isil missile attack in Syria". The Telegraph. 5 January 2019. Retrieved 6 January 2019. ^ "'The fighting was intense': witness tells of two-day attempt to kill Isis leader | World news". The Guardian. Retrieved 2019-03-26. ^ "Kurdish-led forces retake IS group hub in east Syria". France24. 14 December 2018. Retrieved 15 December 2018. ^ Jeff Seldin. "Far From Dead: Tens of Thousands of IS Fighters Linger in Iraq, Syria". Voice of America. Retrieved 14 August 2018. ^ a b "2017 Balance Sheet of War – Syrian Democratic Forces". 3 January 2018. ^ "Results of battles and resistance of YPG throughout 2018". Ypgrojava.org. Retrieved 2019-03-26. ^ "Battle rages for last Islamic State Syria enclave". March 17, 2019 – via uk.reuters.com. ^ "At least 45 fighters of SDF were killed and captured and tens others ran away as a result of carrying out the most violent counterattack by the organization in a month of military operations in the east of the Euphrates". ^ Rempfer, Kyle (3 October 2018). "'Last pocket of ISIS' fighters surrounded, DoD official says". Military Times. Retrieved 15 December 2018. ^ "Mass grave found in last Islamic State bastion: SDF". February 28, 2019 – via www.reuters.com. ^ Operation Inherent Resolve Official Twitter. Marched 25, 2019. ^ a b "Military Strikes Continue Against Daesh Terrorists in Iraq and Syria". Centcom.mil. ^ "US-backed force says resuming anti-IS assault in eastern Syria". Yahoo News. 11 November 2018. ^ "U.S.-backed fighters launch final push to defeat ISIS in Syria". Ctvnews.ca. 2019-02-09. Retrieved 2019-03-26. ^ "On The wake of the"Island Storm" Battle's announcement, US weapons reach to YPG militia". El-Dorar Al-Shamia. 10 September 2017. Retrieved 10 September 2017. ^ a b Chris Tomson (9 September 2017). "Kurdish forces seize four villages from ISIS, race towards Deir Ezzor city". al-Masdar News. Retrieved 10 September 2017. ^ a b c Rami Zien (10 September 2017). "SDF Advances Days after Launching Battle Towards Deir Ezzor". Qasioun News. Archived from the original on 11 September 2017. ^ John Davison (9 September 2017). "U.S.-backed SDF launches operation in Deir al-Zor: statement". Zaman al-Wasl. Retrieved 12 September 2017. ^ Chris Tomson (9 September 2017). "ISIS virtually expelled from Hasakah province as Kurdish troops overrun fifth village". al-Masdar News. Retrieved 10 September 2017. ^ "SDF militias advancing at the expense of (IS) organization in the countryside of Deir al-Zour". El-Dora Al-Shamia. 10 September 2017. Retrieved 10 September 2017. ^ "Al-Jazeera Tempest enter the Industrial City in Deir ez-Zor". Hawar News Agency. 10 September 2017. Retrieved 10 September 2017. ^ Rami Zien (10 September 2017). "SDF Gains Expedited Advance and Reaches the Outskirt of Deir Ezzor City". Qasioun News. Archived from the original on 11 September 2017. ^ Rami Zien (12 September 2017). "SDF Gains New Advance in Deir Ezzor with Potential Collision with Syrian Regime Forces". Qasioun News. Archived from the original on 14 September 2017. ^ Talal Kharrat (13 September 2017). "3 Km. Splits Between Syrian Regime And SDF In Deir Ezzor". Qasioun News. Archived from the original on 14 September 2017. ^ "Operation Cizire Storm on day 5". ANF News. 13 September 2017. Retrieved 13 September 2017. ^ "Al-Jazeera Tempest liberated some sites". Hawar News Agency. 13 September 2017. Retrieved 13 September 2017. ^ "US-backed Forces Vow to Avoid Conflict With Assad Troops in Deir Ezzor". Zaman al-Wasl. 12 September 2017. Retrieved 13 September 2017. ^ Tom Perry, Sarah Dadouch (16 September 2017). "U.S.-backed Syrian fighters say will not let government forces cross Euphrates". Reuters. ^ "Air strikes hit U.S.-backed militia in Syria's Deir al-Zor - SDF". Reuters. 16 September 2017. ^ Thomas Joscelyn (16 September 2017). "Russia struck Syrian Democratic Forces in eastern Syria, US says". Long War Journal. Retrieved 25 September 2017. ^ Justin Clark; Madeline Edwards (21 September 2017). "ISW analyst: Regime, SDF on path to 'confrontation' in oil-rich eastern desert". SYRIA:direct. Retrieved 22 September 2017. ^ "Kurdish forces expand control zone near east bank of Euphrates in Deir Ezzor". al-Masdar News. 2017-09-18. Retrieved 2017-09-18. ^ ""Al Jazeera Tempest" begins Iraqi border liberation campaign". Hawar News Agency. 20 September 2017. ^ "Kurdish forces race along Deir Ezzor highway, three ISIS-held villages seized in pincer offensive". al-Masdar News. 2017-09-21. Retrieved 2017-09-21. ^ "Al-Jazeera Tempest liberated 6 hamlets". Hawar News Agency. 21 September 2017. Retrieved 22 September 2017. ^ "ISIS launches surprise assault on Kurdish forces in Hasakah inflicting uncomfortable losses". al-Masdar News. 2017-09-21. Retrieved 2017-09-21. ^ Chris Tomson (25 September 2017). "Graphic photos: ISIS kills, captures many Kurdish fighters after intercepting US convoy". al-Masdar News. Retrieved 25 September 2017. ^ "ISIS attacks U.S.-led forces south of Hasaka: activist". Zaman al-Wasl. 25 September 2017. Retrieved 25 September 2017. ^ "US-backed SDF captures major Syria gas field". Arab News. 23 September 2017. Retrieved 29 September 2017. ^ "US-backed SDF captures one of Syria's largest gas fields: Commander". Middle East Eye. 23 September 2017. Retrieved 25 September 2017. ^ Chris Tomson (23 September 2017). "Kurdish fighters capture key mountain overlooking the Euphrates River in Deir Ezzor". al-Masdar News. Retrieved 25 September 2017. ^ "U.S.-backed militias says Russian jets struck its fighters in east Syria". Reuters. 25 September 2017. Retrieved 25 September 2017. ^ Andrew Illingworth (25 September 2017). "BREAKING: Russian warplanes bomb Kurdish forces in east Deir Ezzor: reports". al-Masdar News. Retrieved 25 September 2017. ^ Andrew Illingworth (25 September 2017). "Syrian Army, Russian artillery shells Kurdish forces in east Deir Ezzor: reports [Update]". al-Masdar News. Retrieved 25 September 2017. ^ "Strong battles in Sor, 4 mercenaries captured". Hawar News Agency. 24 September 2017. Retrieved 29 September 2017. ^ "Al-Jazeera Tempest: fighters reach al-Sor town's entrance". Hawar News Agency. 26 September 2017. Archived from the original on 30 September 2017. Retrieved 29 September 2017. ^ "SDF makes new gains against ISIS in Deir Ezzor". Zaman al-Wasl. 28 September 2017. Retrieved 29 September 2017. ^ "Strong clashes ongoing in Sor". Hawar News Agency. 28 September 2017. Retrieved 29 September 2017. ^ "Ongoing clashes between the forces of "Al-Jazeera Storm" against ISIS in the northern and northwestern countryside of Deir Ezzor". SOHR. 1 October 2017. Retrieved 1 October 2017. ^ "Jafra Fields are completely liberated". Hawar News Agency. 1 October 2017. Retrieved 1 October 2017. ^ Mohammad Abdulssattar Ibrahim; Madeline Edwards (1 October 2017). "US-backed forces battle IS for Deir e-Zor province's oil-rich east". SYRIA:direct. Retrieved 5 October 2017. ^ "Al-Jazeera Tempest: 2 villages, 4 hamlets liberated". Hawar News Agency. 3 October 2017. Retrieved 5 October 2017. ^ "The Euphrates Tempest : 4 new villages liberated". Hawar News Agency. 4 October 2017. Retrieved 5 October 2017. ^ "Al-Jazeera Tempest: IS attack foiled, fighters progress". Hawar News Agency. 5 October 2017. Retrieved 5 October 2017. ^ "SDF Captures Wasiah Village North Of Deir Ezzor, Temporarily Stops Advance In Center Of Raqqa". 2017-10-07. Retrieved 2017-10-08. ^ "Al-Jazeera Tempest: 17 hamlets, one village liberated". Hawar News Agency. 8 October 2017. Retrieved 8 October 2017. ^ "The Deir Ezzor Military Council and the SDF advance in the western countryside of Deir Ezzor". DeirEzzor24. 4 October 2017. Retrieved 8 October 2017. ^ "Forces of "Al-Jazeera Storm" operation meet with their forces near Deir Ezzor city and take the control of the village of Sheikh of Al-Bakkara Clan whose clan members fight side by side with the regime forces". SOHR. 9 October 2017. Retrieved 9 October 2017. ^ "Kurdish forces seize four ISIS-held villages in dash along the Euphrates River". Al-Masdar News. 10 October 2017. ^ "Horrific images: ISIS executes Kurdish fighters at oil field in Deir Ezzor". Al-Masdar News. 14 October 2017. ^ "Extremely graphic images: ISIS beheads truckloads of US-backed troops in eastern Syria". Al-Masdar News. 16 October 2017. ^ "Breaking: Russian troops take control of key gas field from Kurdish forces in Deir Ezzor". Al-Masdar News. 19 October 2017. ^ "SDF says it captured al-Omar oilfield from ISIL". Al-Jazeera. 23 October 2017. ^ "Race to Albukamal: US-backed forces begin their push to ISIS stronghold". Al-Masdar News. 28 October 2017. ^ "In pictures: ISIS launches major counter-attack on largest oil field in Deir Ezzor". Al-Masdar News. 30 October 2017. ^ "Complete update of eastern Syria battle – map". Al-Masdar News. 1 November 2017. ^ "Kurdish forces zero in on ISIS pockets east of Euphrates River: six villages captured". 3 November 2017. ^ "Kurdish forces zero in on ISIS pockets east of Euphrates River: six villages captured". 6 November 2017. ^ "Kurdish forces overrun another ISIS-held village in eastern Deir Ezzor". 7 November 2017. ^ "US-backed forces capture strategic town in east Deir Ezzor". 8 November 2017. Retrieved 29 November 2017. ^ "US-backed forces finish off last ISIS pocket on eastern bank of the Euphrates River". 12 November 2017. Retrieved 29 November 2017. ^ "US-backed SDF seizes Syria's second largest oil field al-Tanak". Retrieved 29 November 2017. ^ "Kurdish forces push southwards along the Euphrates River, seize village from ISIS". 14 November 2017. Retrieved 29 November 2017. ^ "U.S.-backed forces approach Iraqi border in eastern Syria - Xinhua - English.news.cn". news.xinhuanet.com. Retrieved 29 November 2017. ^ "US-backed forces reach Iraqi border to cutoff Syrian Army advance north of Albukamal". Al-Masdar News. 25 November 2017. Retrieved 30 November 2017. ^ "Syrian Kurdish YPG says it seized eastern region from Daesh". Jordan Times. 3 December 2017. Retrieved 6 December 2017. ^ "Russian airstrikes help Kurdish forces to capture ISIS turf east of the Euphrates River". Al-Masdar News. 9 December 2017. Retrieved 10 December 2017. ^ "VIDEO: ISIS unleashes nasty car bomb attack on US-backed forces killing scores". Al-Masdar News. 9 December 2017. Retrieved 10 December 2017. ^ "US-backed forces seize several towns along eastern bank of Euphrates". Retrieved 17 December 2017. ^ "US-backed forces take advantage of ISIS offensive against Syrian Army to capture more territory". Retrieved 17 December 2017. ^ "US-led airstrike kills 23 civilians in Syria's Deir ez-Zor". Retrieved 17 December 2017. ^ "US-backed forces capture another oil field in Deir Ezzor". Retrieved 17 December 2017. ^ a b "ISIS launches counter-offensive against US-backed forces in Deir Ezzor". Retrieved 30 December 2017. ^ "Large ISIS bastion encircled in east Syria amid relentless advance by pro-Coalition forces towards Abu Kamal". Retrieved 30 December 2017. ^ "'More US diplomats on the ground' in Syria post-ISIS, says Mattis". Retrieved 30 December 2017. ^ "Kurdish forces blitz through ISIS to capture 4 towns in east Syria on the way to Abu Kamal". Retrieved 30 December 2017. ^ "SDF liberate four villages southeast of Deir Ez-Zor". Retrieved 30 December 2017. ^ "Fierce clashes between SDF, IS terrorists in eastern Euphrates River". 30 December 2017. ^ "Kurdish forces mop up the east Euphrates shore inflicting horrific losses on ISIS". 30 December 2017. ^ "Huge ISIS bombing in east Syria by German jihadist leaves nearly 100 US-backed fighters killed, wounded". 1 January 2018. ^ "Air strikes kill 12 civilians in Syria's Deir Ezzor". 1 January 2018. ^ "Kurdish forces push on to capture new town in east Syria despite fierce ISIS counter-attacks". 1 January 2018. ^ "Kurdish forces secure two towns from ISIS in east Syria amid renewed offensive to capture strategic region". 3 January 2018. ^ "Last ISIS pocket along eastern Euphrates steadily collapsing". 3 January 2018. ^ "Kurdish forces battle hard to control 2 key ISIS strongholds in east Syria amid rising losses on both sides". 4 January 2018. ^ "Kurdish forces seize ISIS stronghold in eastern Syria after one week battle". 5 January 2018. ^ "US-Backed Forces Advance In Southeastern Deir Ezzor, eliminate ISIS cell in Raqqa". 5 January 2018. ^ "ISIS counter-offensive in east Syria fails miserably leading to high losses among jihadist ranks". 8 January 2018. ^ "US-backed forces launch attack on Gharanij, repel ISIS attack on Al-Bahra (Photos)". 8 January 2018. ^ "US-backed forces suffer heavy casualties as ISIS captures territory in east Deir Ezzor". 10 January 2018. ^ "Over 120 Syrian members of ISIS joined US-backed forces in Deir Ezzor: SOHR". 10 January 2018. ^ "US-led coalition denies report that ex-Daesh militants joined SDF". 15 January 2018. ^ "US-led forces endure another day of high losses in east Syria as Uzbek ISIS suicide bomber hits his mark". 11 January 2018. ^ "ISIS kills and captures several members of Syrian Democratic Forces in series of attacks". 12 January 2018. ^ "ISIS kicks US-backed forces out of stronghold in east Syria for third time in as many weeks". 14 January 2018. ^ "SDF suffers casualties from series of ISIS attacks southeast of Deir Ezzor". 17 January 2018. ^ "ISIS throws everything they got to keep control of strategic town in Deir Ezzor". 17 January 2018. ^ "German Rapper-Turned-IS Pitchman Reportedly Killed in Syria". 19 January 2018. ^ (www.dw.com), Deutsche Welle. "German rapper-turned-jihadi Denis Cuspert reportedly killed in Syria - DW - 18.01.2018". DW.COM. Retrieved 10 July 2018. ^ "Syrian Democratic Forces repel large ISIS attack on their positions in al-Bahrah village". 19 January 2018. ^ "US-backed forces capture 50% of Gharanij town, kill dozens of ISIS fighters". 20 January 2018. ^ "Syria war: US strikes on IS headquarters 'kills 150 militants'". 24 January 2018. ^ "Syrian Democratic Forces captured key town in southeastern Deir Ezzor (Video)". 24 January 2018. ^ "ISIS claims it killed 185 fighters of Syrian Democratic Forces over last week(Photos)". 26 January 2018. ^ "ISIS claims it killed 377 SDF members over past week(Photos)". 28 January 2018. ^ "ISIS attacks US-backed forces in Gharanij town in Deir Ezzor province (Photos, Videos)". 28 January 2018. ^ "Pictures: Another bloody meat-grinder battle takes place in east Syria as ISIS clings on to key stronghold". 3 February 2018. ^ Chulov, Martin (9 February 2018). "The jihadist 'Beatles': Britons who became the face of Isis cruelty". The Guardian. ^ "US-backed forces renew their attack on ISIS in southeastern Deir Ezzor (Photos)". South Front. 10 February 2018. ^ Illingworth, Andrew (12 February 2018). "Pictures: Kurdish forces blown away in east Syria after double ISIS car bomb attack". Al-Masdar News. ^ Illingworth, Andrew (11 February 2018). "Breaking: Kurdish forces bombed by US coalition airpower in east Syria amid big battle with ISIS – reports". Al-Masdar News. ^ Illingworth, Andrew (12 February 2018). "Breaking: Almost a dozen Kurdish fighters encircled by ISIS in east Syria rescued just in time Iraqi paramilitary forces". Al-Masdar News. ^ "YPG says three foreign fighters killed in Syria clashes". Middle East Eye. 18 February 2018. ^ "US-backed forces captures large part of Al-Bahrah in southeastern Deir Ezzor". South Front. 14 February 2018. ^ "Executive Summary for February 22nd". Syria Deeply. 22 February 2018. ^ "Syrian Democratic Forces capture Al-Bahrah, claim over 1,000 ISIS members killed there (Photos)". South Front. 22 February 2018. ^ "US coalition airstrikes targeting IS kill dozens of civilians in Syria". The New Arab. 26 February 2018. ^ "ISIS attacks US-backed forces in southeastern Deir-Ezzor". South Front. 28 February 2018. ^ "US Coalition Asks for Pause in Hostilities in Northwest Syria". Voice of America. 6 March 2018. ^ "SDF advance 8km against ISIS in Deir ez-Zor". Rudaw. 3 May 2018. ^ "US-backed Syrian fighters spotted in MRAPs prior to ISIS assault". 9 May 2018. ^ "Five top Isis leaders claimed captured on Iraq-Syria border". Financial Times. 10 May 2018. ^ "ISIS loses last link from Iraq border to Euphrates River in Deir Ezzor". Al-Masdar News. ^ "CizireStorm SDF reached al-Baghuz on the Euphrates river". Today news from war on Daesh, ISIS in English from Somalia, Egypt, Afghanistan, Iraq, Syria - isis.liveuamap.com. ^ "US-backed fighters advance against IS in east Syria". 14 May 2018. ^ "...and at least 18 of ISIS were killed in the Coalition's bombardment and in clashes in al-Bahra area". 14 May 2018. ^ "SDF moves on Daesh in Syria sliver | News , Middle East | THE DAILY STAR". dailystar.com.lb. ^ Leith Aboufadel (17 May 2018). "ISIS fully besieged between Syrian Army, SDF lines near Euphrates River". Al-Masdar News. Retrieved 5 August 2018. ^ Wladimir van Wilgenburg (20 July 2018). "US-backed forces continue advance in Syria's Deir al-Zour". Kurdistan 25. Retrieved 21 July 2018. ^ Al-Hal (24 August 2018). "SDF Surrounds Last Area Under ISIS Control". The Syrian Observer. Retrieved 29 August 2018. ^ ANA Press (24 August 2018). "Baghdadi Resurfaces in Recording and for Fighting to Continue". The Syrian Observer. Retrieved 29 August 2018. ^ "SDF announced 'Terrorism Defeat Battle' as part of al-Jazeera Tempest campaign". Hawar News Agency (ANHA). 11 September 2018. ^ "SDF broke through the first defense lines of ISIS". 13 September 2018. ^ "Breaking News: Our Forces Liberate Al-Bagouz Faqani Town". sdf-press. 20 September 2018. ^ "Breaking: ISIS launches big counter-attack in southeast Deir Ezzor". Almasdar News. 21 September 2018. ^ "SDF Takes Village From ISIS in Eastern Deir ez-Zor". The Syrian Observatory for Human Rights. 27 September 2018. ^ "ISIS fights back Kurdish forces in eastern Syria". Almasdar News. 26 September 2018. ^ "ISIS suffers another big setback in east Deir Ezzor (video)". Almasdar News. 8 October 2018. ^ "ISIS releases six Druze hostages". The Jerusalem Post. 20 October 2018. ^ "At least 45 fighters of SDF were killed and captured and tens others ran away as a result of carrying out the most violent counterattack by the organization in a month of military operations in the east of the Euphrates". The Syrian Observatory for Human Rights. 10 October 2018. ^ "وصول تعزيزات لداعش إلى هجين عبر مناطق سيطرة النظام والروس". Xeber24 (in Arabic). 19 October 2018. ^ "More casualties in al-Susah massacres raise the death toll to 58 including 41 civilians, killed by International Coalition warplanes east of Euphrates River". The Syrian Observatory for Human Rights. 20 October 2018. ^ "Breaking News". sdf-press. 22 October 2018. ^ "Outcome Of Engagements In The Battle To Defeat Terrorism". sdf-press. 23 October 2018. ^ "عاجل: تحرير قرية "حاوي السوسة"". sdf-press (in Arabic). 23 October 2018. ^ "(حصيلة الاشتباكات في (معركة دحر الإرهاب". sdf-press (in Arabic). 24 October 2018. ^ "OIR Spokesman on Twitter". Retrieved 31 October 2018. ^ "Jihadists force US-backed coalition retreat in Syria". The Arab Weekly. Retrieved 31 October 2018. ^ "ISIS retakes several towns in southeast Deir Ezzor after launching major counterattack". 29 October 2018. Retrieved 31 October 2018. ^ "Shawn Rodgers on Twitter". Retrieved 31 October 2018. ^ "Iraq's Hashd Al-Shaabi reinforces Syrian border as ISIS scores new advances in Deir Ezzor". 29 October 2018. Retrieved 31 October 2018. ^ "US helps Syrian partners regroup for ISIS 'last stand'". 29 October 2018. ^ "SDF: 49 ISIS terrorists were killed in Hajin". 6 November 2018. ^ "Iraqi forces seize 30 border posts in Syria: report". Xinhua. 6 November 2018. ^ "ق س د تعلن استئناف". hawarnews.com. Retrieved 15 December 2018. ^ "US-backed SDF fighters resume offensive against Islamic State in Syria". 11 November 2018. ^ "Operation Roundup targets ISIS remnants" (PDF) (Press release). November 13, 2018. Retrieved 2019-03-26. ^ "US Coalition unleashes powerful attack as SDF troops prepare counter-offensive". Al-Masdar. 24 November 2018. ^ "IS counter-attacks kill 47 US-backed fighters in east Syria: Monitor". 24 November 2018. ^ "24 SDF Members Killed by ISIS in Syria". 24 November 2018. ^ "ISIS captures over 10 US-backed fighters, kills several others in Deir Ezzor". Al-Masdar. 24 November 2018. ^ "East Syria fighting kills over 200 in 3 days - monitor". 26 November 2018. ^ Aboufadel, Leith (3 December 2018). "Breaking: US-backed forces allegedly enter Daesh's new capital". Retrieved 15 December 2018. ^ Barić, Joško (3 December 2018). "Syrian War Daily – 3rd of December 2018". Retrieved 15 December 2018. ^ a b says, N/A (10 December 2018). "US-backed forces battle Islamic State for control of Hajin, Syria - FDD's Long War Journal". longwarjournal.org. Retrieved 15 December 2018. ^ Aboufadel, Leith (4 December 2018). "US-backed forces break into Daesh's new capital in Syria". Retrieved 15 December 2018. ^ "US-backed fighters break into ISIS holdout in east Syria". 7 December 2018. ^ "Strike Releases". inherentresolve.mil. Retrieved 15 December 2018. ^ Sputnik. "US-Led Coalition Strikes Hajin, Local Hospital Completely Destroyed - Reports". sputniknews.com. Retrieved 15 December 2018. ^ Squitieri, Tom (11 December 2018). "Still no answer on who destroyed hospital in Hajin, Syria, as the battle for the city continues". Retrieved 15 December 2018. ^ "ISIS Actions Lead to Loss of Protected Status". Operation Inherent Resolve. Retrieved 15 December 2018. ^ "SDF, coaliton battle through ISIS-laid mines in Hajin". Rudaw. Retrieved 15 December 2018. ^ Aboufadel, Leith (11 December 2018). "Breaking: SDF troops capture town near Iraqi border". Retrieved 15 December 2018. ^ "Iraqi jets hit two targets, 44 ISIS militants in Syria". Rudaw. Retrieved 15 December 2018. ^ "IS Tactics Prolong Fighting Inside Syrias Hajin - US-Led Coalition Envoy". UrduPoint. Retrieved 15 December 2018. ^ Kurdistan24. "Kurdistan 24 in Hajin: US-backed forces advance amid Islamic State tunnels, snipers". Kurdistan24. Retrieved 15 December 2018. ^ Press, Bassem Mroue, The Associated (13 December 2018). "US-backed Syria Kurds say fight against Islamic State threatened by Turkey". Military Times. Retrieved 15 December 2018. ^ News, A. B. C. (13 December 2018). "US-backed Syrian Kurdish fighters push into IS-held town". ABC News. Retrieved 15 December 2018. ^ amed, zana (13 December 2018). "#SDF flag in #Hajin bazaar place, center of the town. via @ciyager_rojavapic.twitter.com/OVn4ffdAMf". Retrieved 15 December 2018. ^ "SDF control large parts of ISIS stronghold in its enclave east of Euphrates, ISIS withdraws toward the eastern outskirts of Hajin". Retrieved 15 December 2018. ^ "Syrian Kurdish-led fighters take Hajin, last town held by IS". 14 December 2018. ^ December 14, ByHank Berrien; Views, 2018 (14 December 2018). "U.S.-Backed Militia Takes Largest Remaining Town Held By ISIS In Syria". Daily Wire. Retrieved 15 December 2018. ^ "The International Coalition warplanes continue their targeting to ISIS enclave in the east of the Euphrates along with the continued fighting in the outskirts of Hajin where the latter collapsed. SOHR. 14 December 2018". Retrieved 15 December 2018. ^ correspondent, Martin Chulov Middle East (14 December 2018). "Isis withdraws from last urban stronghold in Syria". Retrieved 15 December 2018 – via www.theguardian.com. ^ "ISIS has executed 700 prisoners since Hajin ouster: war monitor". Rudaw. 2018-12-19. ^ "Daesh's last Euphrates pocket on the verge of collapse (map)". Almasdarnews.com. 2017-12-21. Retrieved 2019-03-26. ^ "SDF troops score big advance in east Syria as US continues strikes against ISIS". Al-Masdar. 21 December 2018. ^ "SDF captures key town from ISIS in east Deir Ezzor (map)". Almasdarnews.com. 2017-12-21. Retrieved 2019-03-26. ^ "Kurdish-led forces capture 262 IS militants trying to flee eastern Syria". Xinhua. 25 December 2018. ^ "SDF troops enter ISIS-held town in eastern Deir Ezzor". Almasdarnews.com. 2017-12-21. Retrieved 2019-03-26. ^ "Kurdish forces rush to defeat ISIS amid Turkish threat in northern Syria (map). Al-Masdar". Almasdarnews.com. 2017-12-21. Retrieved 2019-03-26. ^ Joško Barić (2018-12-29). "Syrian War Daily – 29th of December 2018". Syrianwardaily.com. Retrieved 2019-03-26. ^ Leith Aboufadel (2019-01-01). "SDF reach gates of ISIS stronghold east of the Euphrates – map". ^ "Two British soldiers injured in Islamic State attack in Syria". Bbc.com. Retrieved 2019-03-26. ^ "US-led coalition pounds Daesh-held village in eastern Syria". Arabnews.com. 2019-01-08. Retrieved 2019-03-26. ^ "US teenager captured in Syria while fighting with ISIS". Almasdarnews.com. Retrieved 2019-03-26. ^ "Map Update: Syrian Democratic Forces Capture Ash-Shafah, Advance On Albu Badran In Euphrates Valley". Southfront.org. Retrieved 2019-03-26. ^ "ISIS once again loses east Euphrates stronghold to SDF troops: map". Almasdarnews.com. 2017-12-21. Retrieved 2019-03-26. ^ "ISIS is on their last legs as SDF troops approach the terrorist group's last stronghold". Almasdarnews.com. 2017-12-21. Retrieved 2019-03-26. ^ "US-backed Syrian force: Daesh is in 'its final moments'". Arabnews.com. 2019-01-13. Retrieved 2019-03-26. ^ "SDF troops begin major push to capture last ISIS stronghold in eastern Euphrates region (map)". Al-Masdar. 15 January 2019. ^ "US backed Kurdish group seize key village from IS militants in Syria". Middle East Eye. ^ "ISIS suffers devastating defeat after losing last major stronghold east of Euphrates (map)". Almasdarnews.com. 2017-12-21. Retrieved 2019-03-26. ^ Joško Barić (2019-01-18). "Syrian War Daily – 18th of January 2019". Syrianwardaily.com. Retrieved 2019-03-26. ^ "Triple Attack on ISIS Last Pocket East of Euphrates". Aawsat.com. Retrieved 2019-03-26. ^ "ISIS on last legs in eastern Euphrates after losing another town - map". Almasdarnews.com. 2017-12-21. Retrieved 2019-03-26. ^ Joško Barić (2019-01-22). "Syrian War Daily – 22nd of January 2019". Syrianwardaily.com. Retrieved 2019-03-26. ^ "Nearly 5,000 flee last IS enclave in eastern Syria: monitor". France 24. January 22, 2019. ^ a b "US coalition forces overrun last ISIS village in Syria". The National. ^ "US-backed SDF forces close to victory in last ISIS-held pocket: Monitoring group". Kurdistan24.net. 2019-01-22. Retrieved 2019-03-26. ^ "Kurd-led forces overrun last Daesh-held village in Syria: monitor". 23 January 2019. ^ "Nearly 5,000 flee last ISIS enclave in eastern Syria". English.alarabiya.net. Retrieved 2019-03-26. ^ "Down to Its Last 2 Villages in Syria, ISIS Still Fights Back". New York Times. 24 January 2018. ^ Leith Aboufadel (24 January 2019). "ISIL's reign over eastern Euphrates nearing its end – map". Al-Masdar News. Retrieved 25 January 2019. ^ Francesco Bussoletti. "Syria, the final battle of the SDF against Isis to Deir Ezzor began". Difesaesicurezza.com. Retrieved 2019-03-26. ^ "Desperate ISIS terrorists use suicide attacks in eastern Euphrates counter-offensive". Al-Masdar News. 25 January 2019. Retrieved 15 February 2019. ^ "Syrian Army indirectly helps SDF troops with heavy attack against ISIS in eastern Euphrates region". Almasdarnews.com. 2017-12-21. Retrieved 2019-03-26. ^ "About 35 ISIS members were killed and 21 others were captured in the failing attack by the organization on positions of the SDF in Al-Baghuz". ^ "ISIL 'caliphate' in Syria to be defeated within month: SDF chief". Al-Jazeera. 25 January 2019. Retrieved 25 January 2019. ^ Rukmini Callimachi (24 January 2019). "Down to Its Last 2 Villages in Syria, ISIS Still Fights Back". The New York Times. Retrieved 25 January 2019. ^ "Large group of would-be ISIS suicide bombers surrender themselves in easern Syria". Almasdarnews.com. Retrieved 2019-03-26. ^ Joško Barić (2019-01-26). "Syrian War Daily – 26th of January 2019". Syrianwardaily.com. Retrieved 2019-03-26. ^ "01/26: The Northern Democratic Brigade takes part in clashes against the Islamic State in al-Marashida". Syriancivilwarmap.com. Retrieved 2019-03-26. ^ "US Air Force reportedly kills ISIS commander in eastern Deir Ezzor". Almasdarnews.com. 2017-12-21. Retrieved 2019-03-26. ^ "Coalition Strikes Kill 42 in ISIS Syria Holdout". 26 January 2019. ^ "4 IS suicide bombers target Kurdish-led forces in eastern Syria". 26 January 2019. ^ "The once vast ISIS 'caliphate' is now reduced to a pair of villages in Syria". The Washington Post. 27 January 2019. ^ a b "Daesh counts its last breaths". DeirezZor24. 2019. ^ "ISIS hanging on by a thread as SDF troops make last push east of the Euphrates". Almasdarnews.com. 2017-12-21. Retrieved 2019-03-26. ^ Rouba El Husseini (2019-01-28). "IS in Syria boxed in to shrinking pocket". Yahoo.com. Retrieved 2019-03-26. ^ "Scores of civilians, fighters depart Daesh stronghold in Syria". Arabnews.com. 2019-01-28. Retrieved 2019-03-26. ^ "Islamic State pinned in tiny eastern Syria enclave with families,..." January 29, 2019 – via www.reuters.com. ^ "ISIS pinned in tiny eastern Syria enclave: SDF". Egypt Independent. January 29, 2019. ^ "Are you a robot?". Bloomberg. Retrieved 2019-03-26. ^ "ISIS commander killed in terrorist group's last town east of Euphrates". Almasdarnews.com. 2017-12-21. Retrieved 2019-03-26. ^ "Three Yazidis were rescued in eastern Syria after being abducted by ISIS in 2014". Almasdarnews.com. 2017-12-21. Retrieved 2019-03-26. ^ "ISIS still trafficking Yazidi women: Iraqi official". Diyaruna.com. Retrieved 2019-03-26. ^ Francesco Bussoletti. "Syria, the SDF in Deir Ezzor advance against last Isis praesidium: Arqoub". Difesaesicurezza.com. Retrieved 2019-03-26. ^ "U.S.-backed Syrian forces reject ISIS request for safe passage to Turkey". Ahvalnews.com. 2019-02-01. Retrieved 2019-03-26. ^ "IS uses thousands of civilians as human shields - ANHA | HAWARNEWS | English". hawarnews.com. ^ "Waiting for the remaining leaders and ISIS members to surrender, US Forces continue to search for internationally wanted persons as clashes stop at the east of Euphrates". ^ "SDF evacuate IDPs/ISIS families from Baghuz. Off camera, US SOF hand out water, nappies and MREs and screen men separately, looking for fleeing ISIS fighters". Syria.liveuamap.com. Retrieved 2019-03-26. ^ "5 Turkish families arrived to SDF areas - ANHA | HAWARNEWS | English". hawarnews.com. ^ "New families arrive to SDF-liberated areas from foreign nationalities - ANHA | HAWARNEWS | English". hawarnews.com. ^ "Trump says may declare ISIS defeated next week". Straitstimes.com. 2019-02-07. Retrieved 2019-03-26. ^ "ISIS 'caliphate' down to 1 per cent of original size as final assault nears". Straitstimes.com. 2019-02-08. Retrieved 2019-03-26. ^ Leith Aboufadel (7 February 2019). "ISIS squeezed into last areas as SDF troops capture 2 villages east of the Euphrates (MAP)". Al-Masdar News. Retrieved 15 February 2019. ^ "SDF commander: 80% of al-Baguz liberated, progression is ongoing - ANHA | HAWARNEWS | English". hawarnews.com. ^ "SDF will attack IS Syria enclave once civilians out: official". February 9, 2019 – via www.reuters.com. ^ "عاجل: قوات سوريا الديمقراطية تطلق معركتها الأخيرة – قوات سوريا الديمقراطية – Syrian Democratic Forces". Sdf-press.com. Retrieved 2019-03-26. ^ "SDF launches 'final battle' against Islamic State Syria enclave". Middle East Eye. ^ "US-backed Fighters Launch Final Push to Defeat IS in Syria". VOA News. 2019-02-09. ^ "SDF liberate 2km2, violent clashes continue - ANHA | HAWARNEWS | English". hawarnews.com. ^ "The clashes outcome in the war against terrorism". Sdf-press.com. Retrieved 2019-03-26. ^ "US unleashes massive attack on last ISIS bastion in eastern Euphrates". Almasdarnews.com. 2017-12-21. Retrieved 2019-03-26. ^ "Coalition warplanes hit last Islamic State enclave in eastern Syria". Rodi Said, Reuters. 11 February 2019. ^ "US-backed fighters closing in on Daesh gunmen in eastern Syria. 16 February 2019". Arabnews.com. 2019-02-16. Retrieved 2019-03-26. ^ "Fear for Civilian Lives Slows Effort to Recapture Last ISIS Stronghold in Syria. 24 February 2019. Retrieved 26 February 2019". Haaretz.com. 2019-02-24. Retrieved 2019-03-26. ^ "Told to leave, ISIS 'caliphate' holdouts in Syria stay devoted". 23 February 2019. Retrieved 26 February 2019. ^ a b "To the bitter end, IS militants remain organized and brutal". Associated Press. 6 March 2019. Retrieved 9 March 2019. ^ "'Blood up to your knees': defeated IS jihadists still defiant". Yahoo! News. 8 March 2019. Retrieved 9 March 2019. ^ "SDF fully defeats ISIS". 23 March 2019. Retrieved 23 March 2019. ^ Lister, Tim (8 February 2018). "Rare US airstrikes on pro-regime forces bring latest turn in Syrian War". CNN. ^ Aboufadel, Leith (10 February 2018). "Syrian fighters defiant after US coalition airstrikes in Deir ez-Zor (video)". Al-Masdar News. ^ Illingworth, Andrew (9 February 2018). "Breaking: US-led forces launch all-out offensive against Syrian Army in Deir Ezzor". Al-Masdar News. ^ Illingworth, Andrew (9 February 2018). "Reports of offensive by US-led forces against Syrian Army in Deir Ezzor may be false – opposition media begins scare campaign". Al-Masdar News. ^ a b "U.S.-backed forces say they regain villages seized by Syrian army". Reuters. 29 April 2018. Retrieved 29 April 2018. ^ "Syria regime, US-backed forces in deadly clashes: Monitor". ^ "SDF Regain Control of Villages Near Euphrates Captured by Syrian Army". Murasolen. 29 April 2018. Retrieved 29 April 2018. ^ "U.S.-backed forces say they regain villages seized by Syrian army". April 29, 2018 – via uk.reuters.com. ^ "Syria: SDF reclaim territory hours after government capture". Aljazeera.com. 2018-04-29. Retrieved 2019-03-26. ^ "Update: US warplanes purposely avoided striking Syrian Army during Deir Ezzor attack, only fired warning shots – Pentagon". Almasdarnews.com. 2017-12-21. Retrieved 2019-03-26. ^ "Lead Inspector General for Operation Inherent Resolve I Quarterly Repo". Department of Defense Office of Inspector General. Retrieved 15 December 2018. ^ "ISIS Gone? Trump Claims Group is Defeated But One Year After Losing Iraq, It's Hanging on in Syria". Newsweek. 12 December 2018. ^ Hassan, Falih; Nordland, Rod (9 December 2018). "Battered ISIS Keeps Grip on Last Piece of Territory for Over a Year". Retrieved 15 December 2018 – via NYTimes.com. ^ "After defeat in Iraq, ISIS fights on in last enclave in Syria". Military Times. 9 December 2018. ^ "US-backed SDF vows to escalate operations against Islamic State in Syria". Channelnewsasia.com. Retrieved 2019-03-26. ^ "US intelligence chief contradicts Trump on ISIS defeat". CNN. 29 January 2019. ^ "Thousands Evacuate Last Islamic State Hold-Out in Syria". Voice of America. 26 February 2019. ^ "Syria's Kurds set free nearly 300 Daesh-linked Syrians. 3 March 2019". Arabnews.com. 2019-03-03. Retrieved 2019-03-26. ^ "Syria war: Kosovo brings back 110 citizens including jihadists". BBC. 20 April 2019. ^ "Bosnia brings back, detains Islamic fighter from Syria". Reuters. 20 April 2019. This page was last edited on 23 April 2019, at 03:07 (UTC).